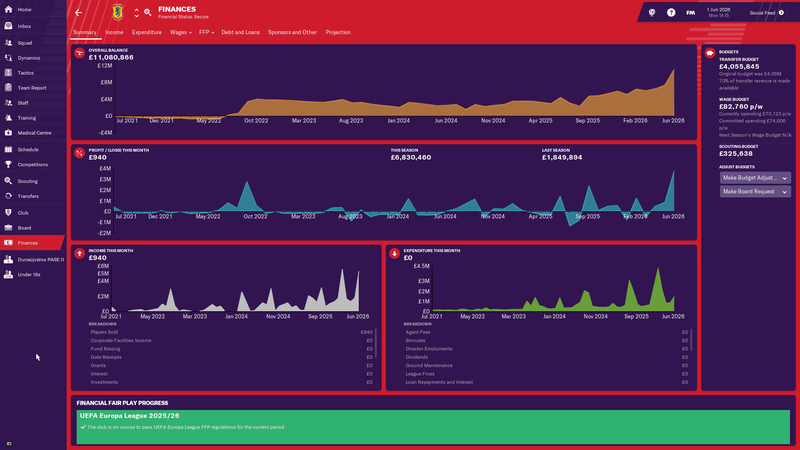 @Crispypaul - congratulations on the instant promotion! Does that put you into the top flight (I can't remember how many divisions Norway has) and if so, do you think that might help you get your finances under control? @2481 - comfortable title defense there and a strong European run. £25m is nothing to sneeze at but probably doesn't give you the money to go chasing the world's very best players. Any thoughts about cashing in on someone like Arabidze to really give you some financial muscle to stretch, or do you think that new stadium income plus continued Champions League football will be enough to get you there? Also congrats on the Italy job! @Balahara - good luck! 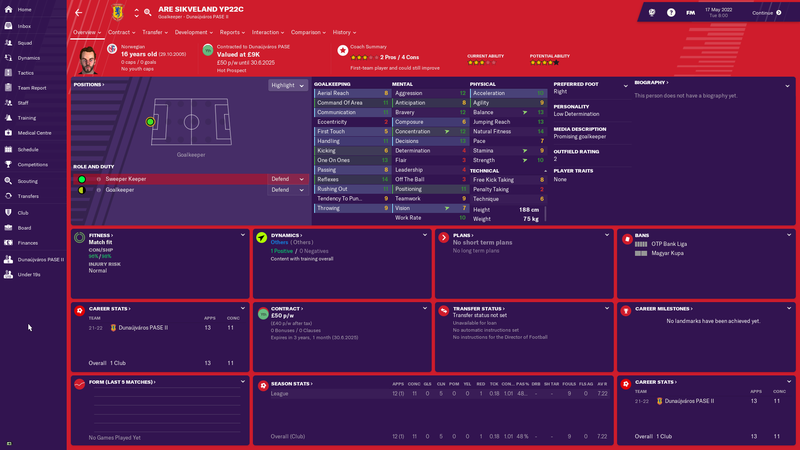 I've already had a great Czech Republic regen come and go at my club, hoping you can find some gems yourself! Cheers - Norway has 4 tiers in vanilla FM (although you can't manage in the 4th), this would put me into the 2nd. Cheers! Italy's going quite well so far. Yeah the transfer budget is enough to bring in foreign wonderkids etc but not enough to compete for top players (unless they're listed). Arabidze - no chance He's a club icon now and I think I'd do well to find a replacement to be honest. Sheer class! Here's where things stand with 10 games to go! Second place on goals scored as we have the same amount of points and the same goal difference as Young Boys. It's going to be a pretty nerve-wracking run in! What a season! We started off on an absolute tear, staying unbeaten and winning 9 of our first 10 games including a 1-0 away win over Young Boys, the most dominant team in the league and aiming for their 6th straight title. We kept that run going until we matched up with Young Boys again for our second (out of four) league meeting against them, when they came to our place and beat us 4-2. Our form dipped a little bit at that point as we started to draw matches we should have won, but we were still at the top of the table. But Young Boys were slowly gaining on us, and beat us 2-0 in our 3rd meeting to come within 2 points of us. When we could only manage a draw against FC Basel (the only real competition to Young Boys thus far), our points lead at the top was erased, though we managed to hang on to top spot on goal difference. We were playing decently but our relatively small and inexperienced squad was beginning to show wear and tear and we weren’t able to score as many as we would like. We were winning games by one or at most two goals while Young Boys had found their form and were dismantling teams by three or four. 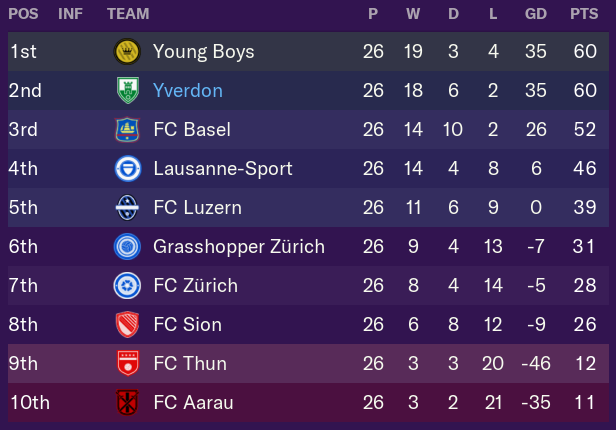 Finally, while we scraped out a 3-2 win over second from bottom FC Aarau, Young Boys crushed FC Sion 3-0 to draw level with us on goal difference and points - and ahead of us on the next tie breaker, goals scored. And in each of the next three games we won by a single goal while Young Boys won theirs by a combined 8-1, meaning that they were beginning to pull away on goal difference. A sense of the inevitability of Young Boys being able to gradually get away from us began to set in, and it didn’t help that our next fixture was our final meeting with them. We needed to win this, or it seemed like the title was going to slip away from us. We took the lead in the 19th minute through Bassirou Kone , and had the best of the game in terms of possession and chances - but with ten minutes left on the clock substitute Wouter Burger leveled things for Young Boys. It finished 1-1, which meant we were still level on points but behind on goal difference with six games remaining. Determined to give it our best shot (and finally out of all other competitions so our thin squad could get some rest), in our next game we smashed FC Zurich 4-0 while Young Boys faced their crosstown rivals Grasshopper Zurich and - shockingly - went down to a 2-1 defeat. All of a sudden we were in the drivers seat, 3 points clear with 5 games left. We won our next three but then drew 1-1 with our rivals Lausanne-Sport, to set up a nail biting final day - we were ahead by one point but our goal difference was a goal worse than Young Boys and we were eight goals worse off on goals scored. In other words, we would win the league by matching Young Boys’ result, but any situation where we got a worse result than them would lead to them winning due to their superiority on all tiebreakers. But it didn’t come to that as we managed a 2-0 win in front of our own fans against FC Sion to deliver the title on the final day of the season. We started well with a 5-0 win over lower league Martigny, then followed that up with a comfortable 2-0 win over Challenge League side Kriens. In the 3rd Round, we were drawn away to Young Boys, but came away with a spectacular 4-2 victory to progress to the Quarter Finals. 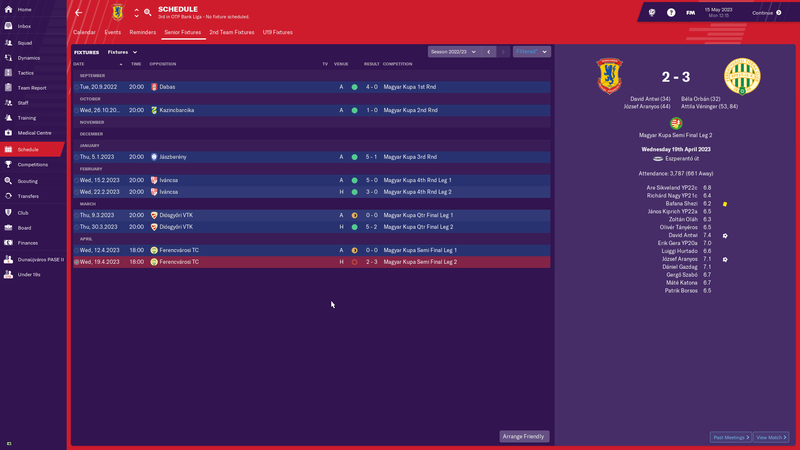 We were drawn against Super League side FC Sion, but there was a four month gap between the two games, and by the time the match came around we were really struggling with the demands of competing in the Super League, the Europa League, and the Swiss Cup. We gave it our best shot but finally succumbed to a 2-1 defeat in extra time. In the Qualifying Rounds, we faced Croatian side HNK Rijeka, who we cruised past 7-1 on aggregate, and Rosenborg of Norway, who we were also easily able to take care of with a 5-1 aggregate win. We got a decent draw for the group stage, facing Marseille, Red Star Belgrade, and Sturm Graz of Austria. We started things off in thumping fashion with a 5-0 trouncing of Red Star at home, followed by a 1-0 win against them at their place, and a 2-0 win away at Sturm Graz. 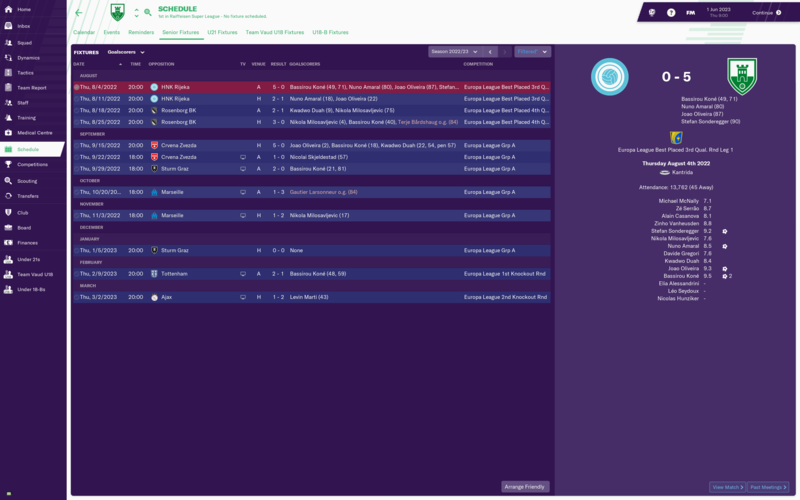 We went down to a 3-1 defeat away at Marseille next, but results elsewhere went our way and we were already guaranteed to qualify for the knockout stages no matter what our remaining results (a 2-1 defeat against Marseille and a 0-0 draw against Sturm Graz at home). Our draw for the 1st Knockout Round was away to Tottenham, which I assumed was going to be the end of the road for us - as long as we weren’t on the wrong end of a lopsided result, I was going to be happy. But amazingly we pulled out a 2-1 win to go through to the next round, where we would face Ajax. That finally proved a bridge too far as we went down to a 2-1 defeat, but still I have to be impressed with our progress in the competition and it bodes decently well for the Champions League next season. 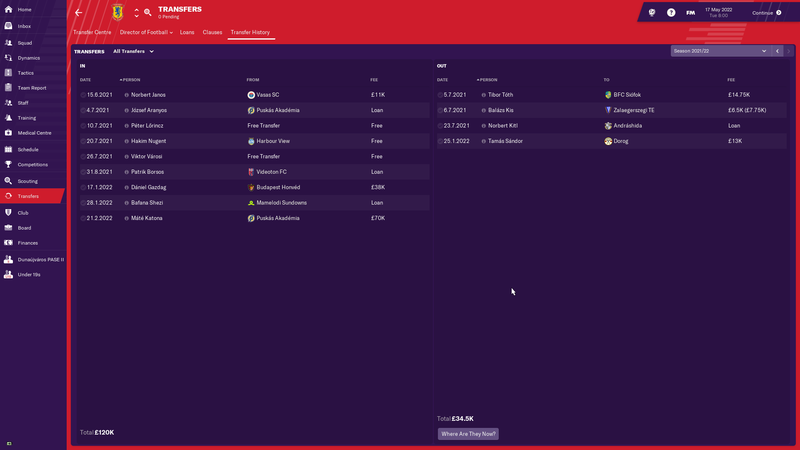 I wanted to move away from being as reliant on loan players this season, so we splashed the cash with a £725k outlay during the summer along with a big increase in our wage expenditures, bringing in a total of five players all of whom would find places in the first XI. 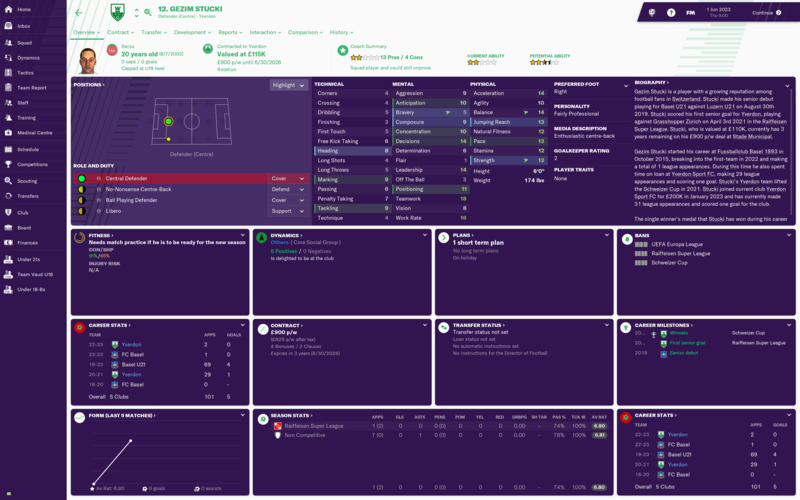 Included in that haul were Zinho Vanheusden, who we’d had on loan from Inter for the past two seasons and who was our player of the season last year - his Inter contract was expiring so we snapped him up with our greatly expanded wage budget. 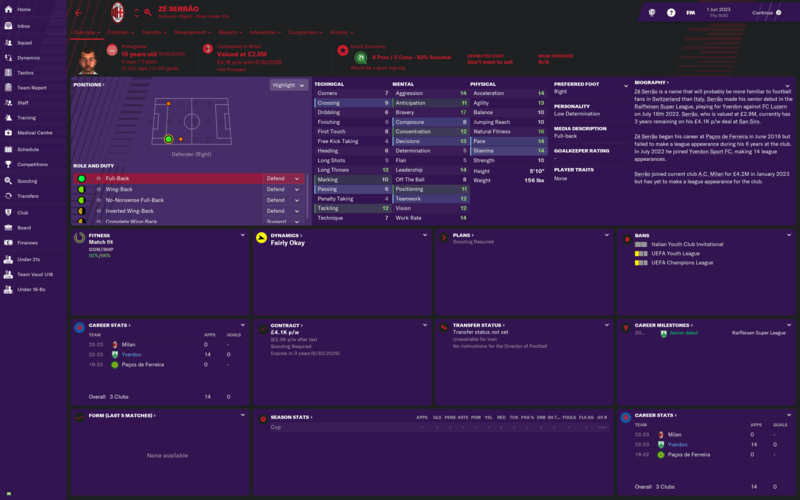 The biggest transfer was Nuno Amaral, a Portuguese box to box midfielder, who cost us £575k from AC Milan (a nice profit for them as they’d signed him on a free the season before). 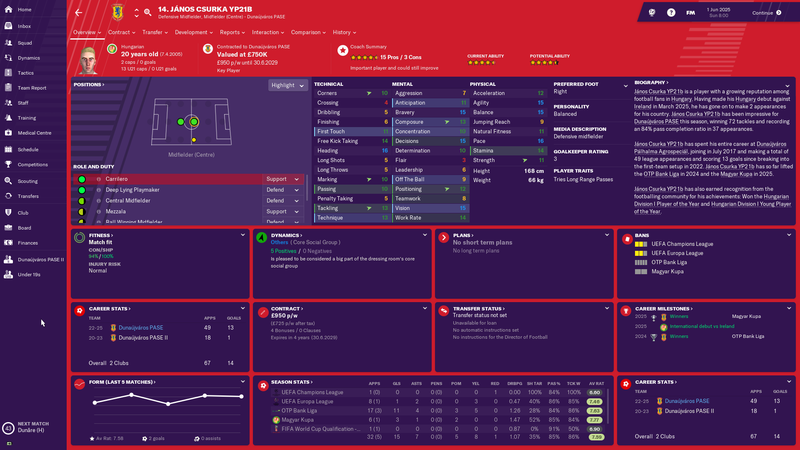 Perhaps the most consequential transfer though was Portuguese U-21 right back Ze Serrao, who we brought in on a free transfer from Pacos de Ferreira. 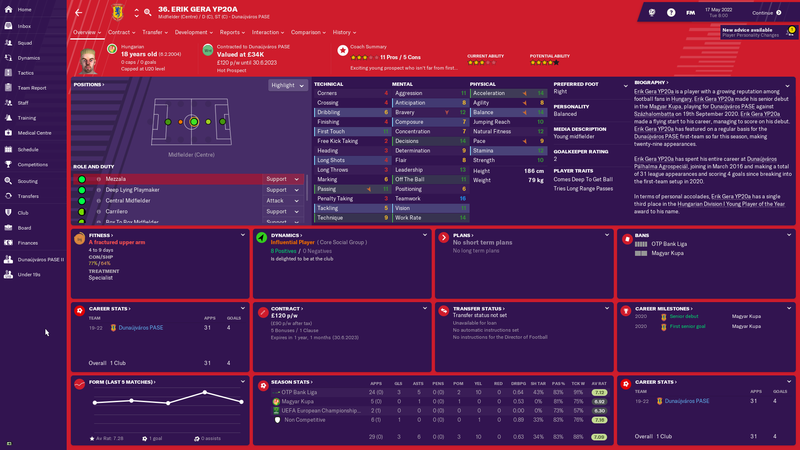 Diego Seoane was getting on a bit and moving on during the summer, so we were in search of a right back and my scouts were impressed with him so I figured why not give him a shot? 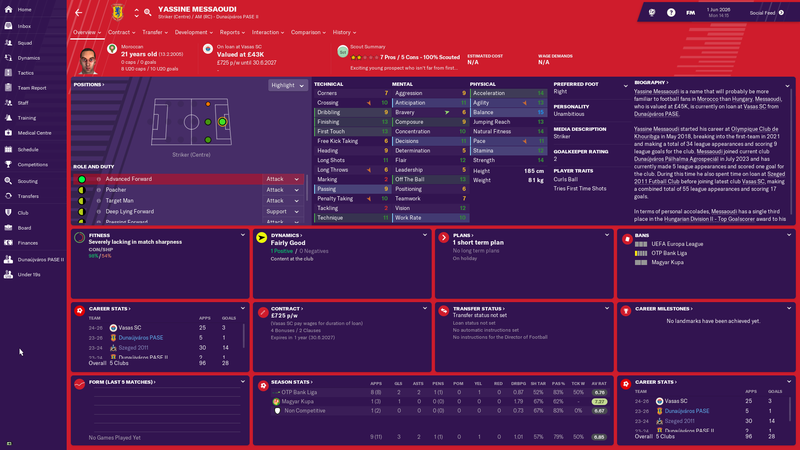 Turns out he was a bit good - in the first half of the season he made 26 competitive starts for us, getting 10 assists, 3 player of the match awards, and a 7.57 average rating. 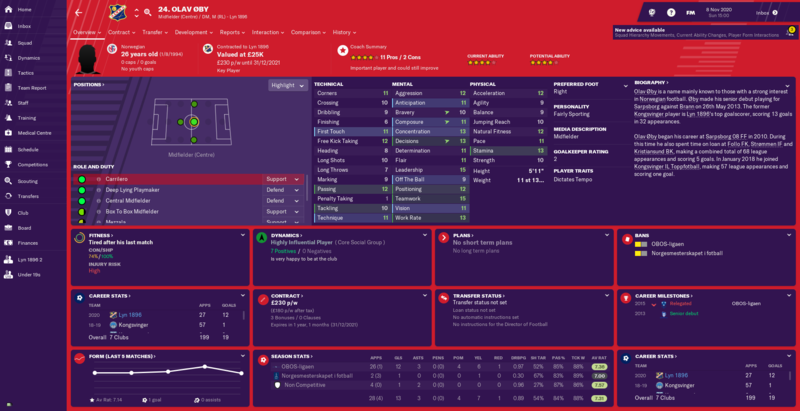 Suddenly the £4.2m release clause, which I hadn’t even thought about when negotiating his contract, became significant as AC Milan, Inter, and Napoli all put in bids during the January transfer window. 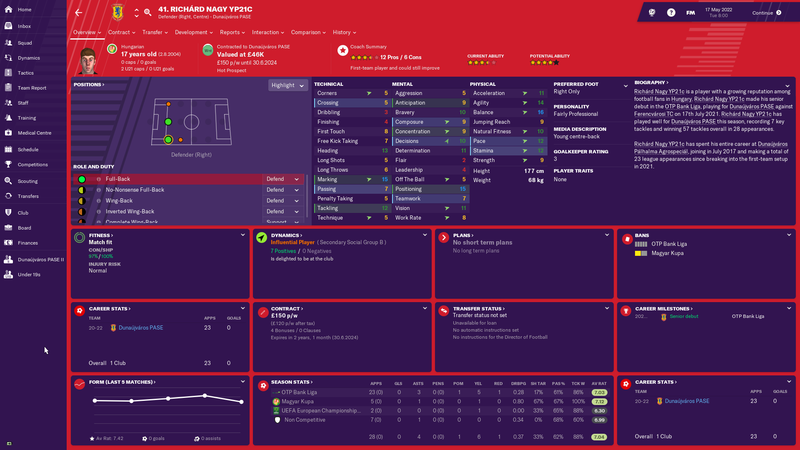 He opted for Milan, which left us £4.2m richer but lacking a right back, and facing a bit of a squad rebellion about the lack of depth in defense. 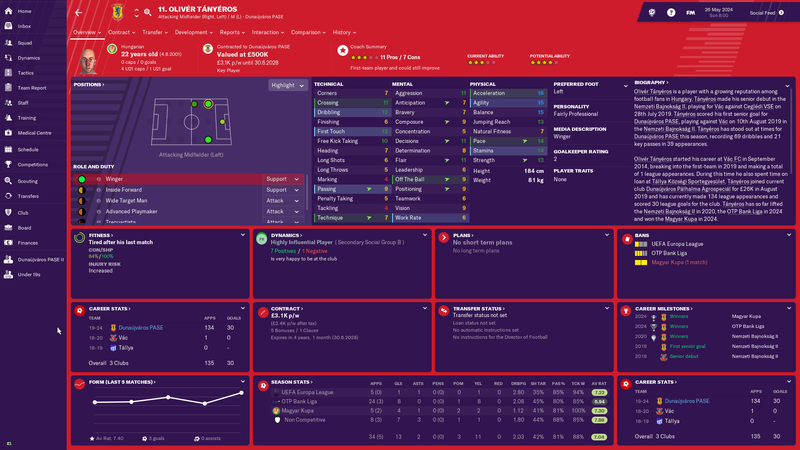 So I was forced to have a more active January window than I intended, signing Swiss U-21 right back Haris Fassnacht from FC Zurich, central defender Gezim Stucki (who we’d had in on loan previously) from FC Basel, and left back Lorenzo Hamon from Neuchatel Xamax for a total outlay of £440k. 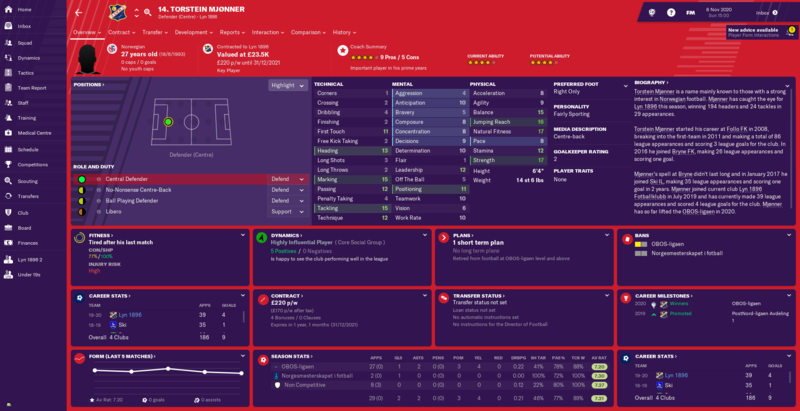 In addition, our squad was stretched thin especially in our left and right wing positions, so I also signed Swiss U-20 international Levin Marti from FC Sion for £550k. At the end of all that we have what I would consider a very talented squad with a lot of young prospects. Clearly, it’s good enough to be a force in Swiss football and I think a lot of these players can still grow. The issue will be keeping people happy and not having the team broken up by bigger clubs - and keeping the team spirit together if people do leave (as evidenced by the mini rebellion over the departure of Ze Serrao). 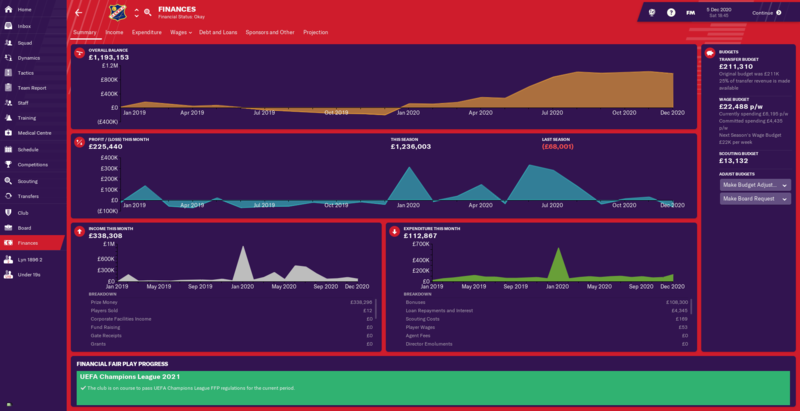 Another season of success on the pitch has led to an even better financial situation off the pitch - even though our spending on wages is now up to £78k p/w and we spent about £1.7m on transfers this season, we still ended up making a profit of around £6m this season, mainly again through prize money. 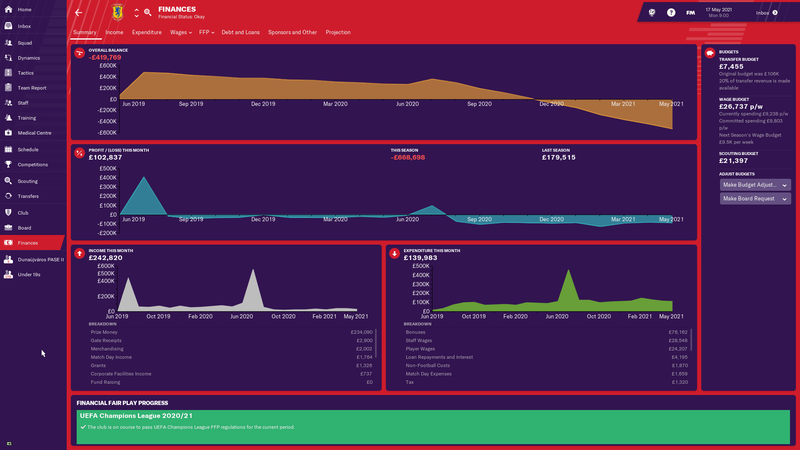 With the prospect of Champions League cash coming next season - thanks to the performance of other Swiss teams recently, as champions we will go straight into the group stage - we’re only likely to see that bank balance grow. I feel fairly confident we’ve established ourselves as a force to be reckoned with in Swiss football, though whether we can repeat next season remains an open question. With Champions League money coming in, we should be able to continue to grow the club. 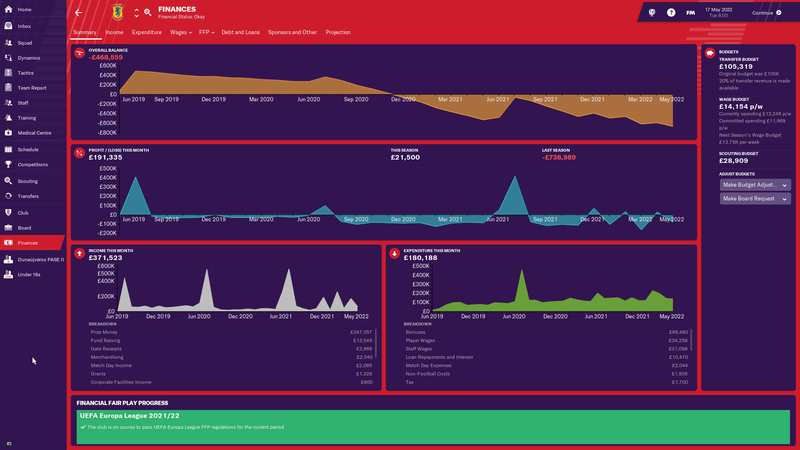 One area of concern is attendances - despite our impressive performances, our average attendance was 4,789, up just 267 from last season and only about 60% of the capacity of our 7,900 stadium. I also asked for the board to improve the below average youth facilities and was told I should just purchase players for the first team rather than trying to develop them. Finally, a fun fact that didn’t really fit anywhere else - four years in charge of Yverdon now and we have still to pick up a single red card. I’m kind of proud of that record! So, I decided to join this. I don't think I've played it since Gundos was it's own challenge, but I've always enjoyed it. So here I am. I've decided to go to Hungary, mostly because I had a great save there for many many years ago with Budafok. 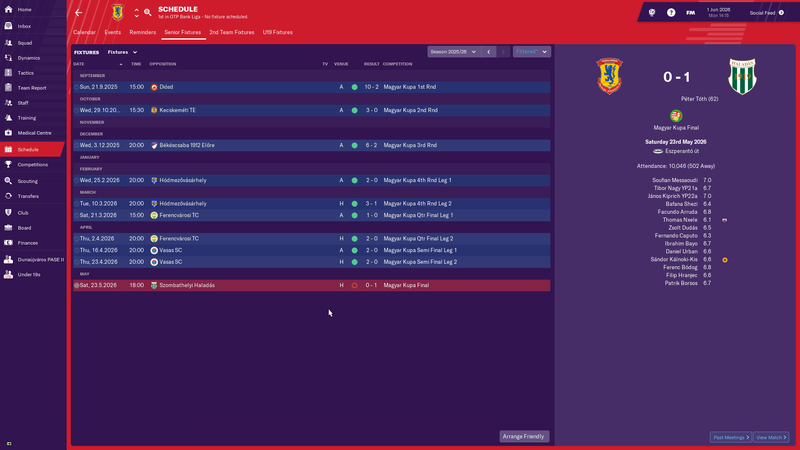 Since Budafok are now playing in the 2nd tier, they cannot be played so I had to find someone else to manage. I decided on Dunaújváros PASE! The club come from Dunaújváros, an industrial city south of the capital Budapest. 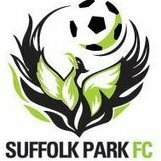 The club had a moment in the top tier back in 2014/15, but two consecutive relegations saw them going into the lower leagues. But now the club are on the way up again! We have a decent stadium of just above 10k (12k in the link somehow...), though mostly standing, and only 2k seats. Though, I think that will be more than enough to start with. The squad is decent if unspectacular, but I haven't decided on a tactic yet, so we shall see. And finally, here I am in all my glory. 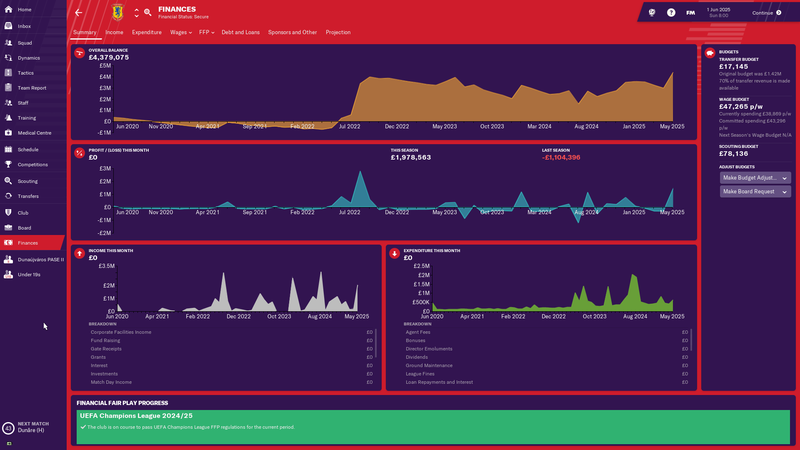 At the moment my stats aren't much to write home about, but that will hopefully change relatively soon. Thanks! I like playing in Hungary, but I can't quite say why. League - Table | Fixtures 1 | Fixtures 2 - well that went a lot better than expected - I am not sure whether we were stronger than everyone else or they were weaker than us but it was a pretty straightforward title win in the end. Key players: Transfers - another season of change. 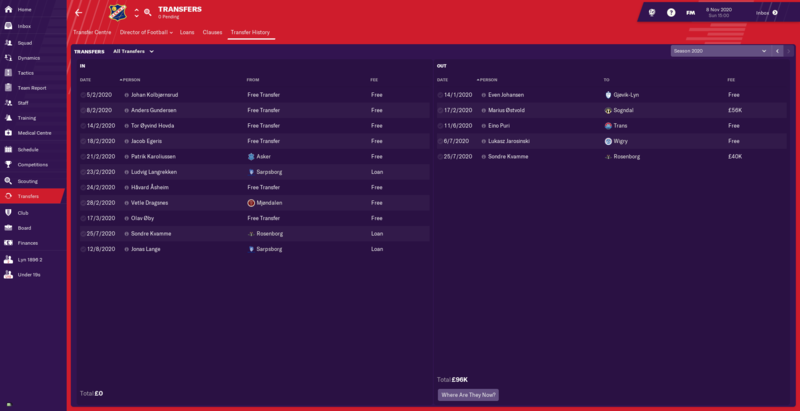 Unfortunately we had an insecure status at the start of the season so the board accepted stupidly low offers for Ostvold and Kvanne - at least with Kvanne I managed to offer him out in time and Rosenborg offered £40k + 50% profit + loan back for 12 months. Still quite frustrating mind. So terrible I didn't bother tagging anyone. 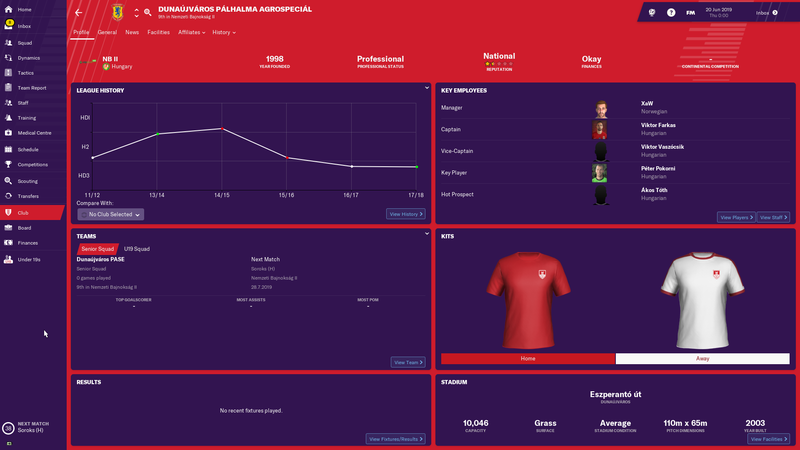 Finances - a lot more solid than before, so I've managed to get a couple of improvements to the youth coaching and recruitment (now good/average). 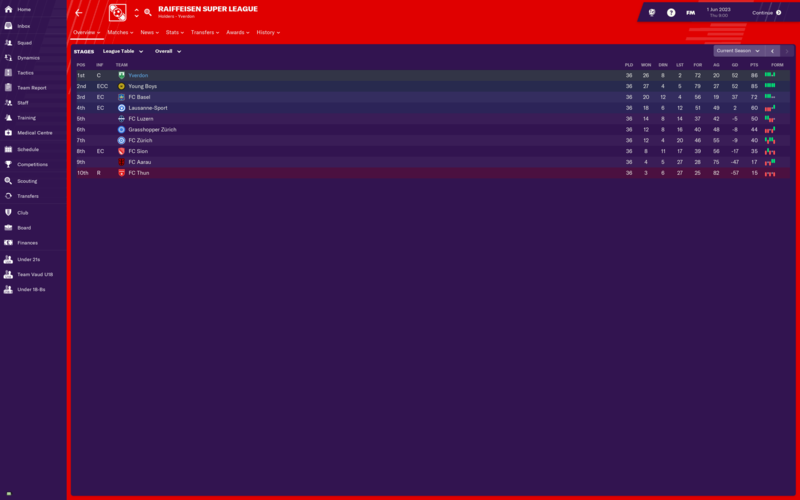 As happened when I did this in FM18, we are in the top division as a semi-pro club so going to struggle next season. Hopefully we can stay up. So, back in Hungary. A country I've been looking at managing in for some time. After I took over the club I took a long look at the squad and managed to get rid of some deadwood and bring in some talent. However, as the first league match came I found out there are some unforeseen rules were in effect. At all times I need a U20 player on the pitch. And I need two U21 players on the pitch at all times. AND the match day squad need 4 U21 players for every game. 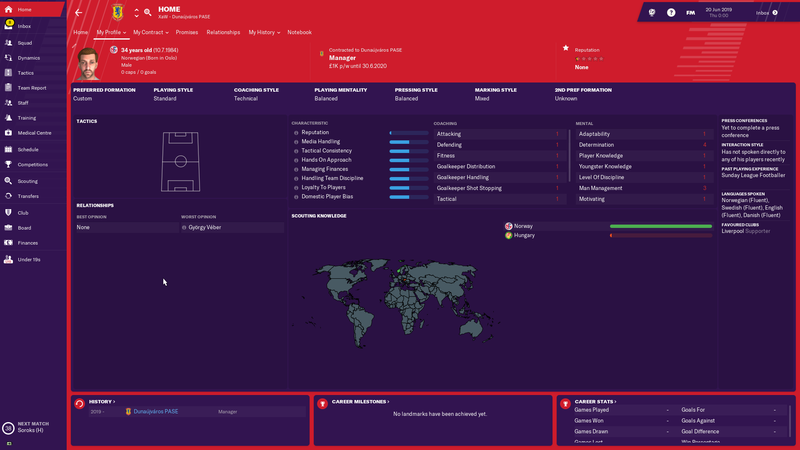 Now, as I took over the club I only had a couple of decent U21 players and no U20 players anywhere close to good enough to play for us. So I had to go out shopping. My problem were that very few players would want to join me, but I found a decent prospect in István Sajbán. He were not anywhere near as good as the strikers I have, but I had to get someone in. 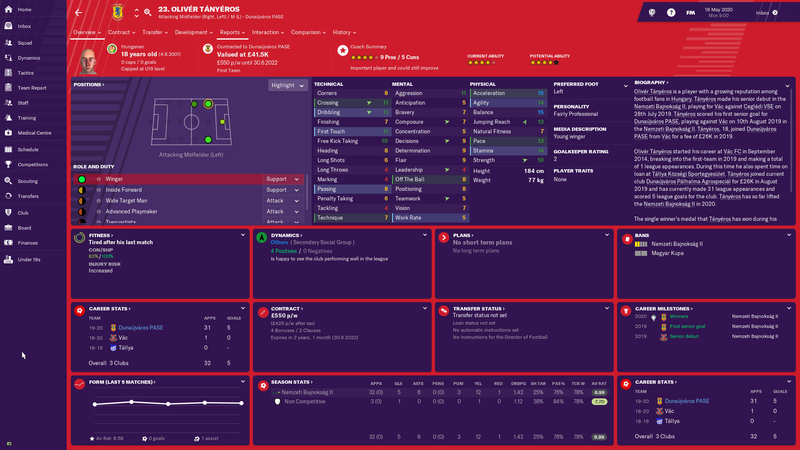 A little while later one of my scouts recommended Olivér Tányéros, a young talented winger. 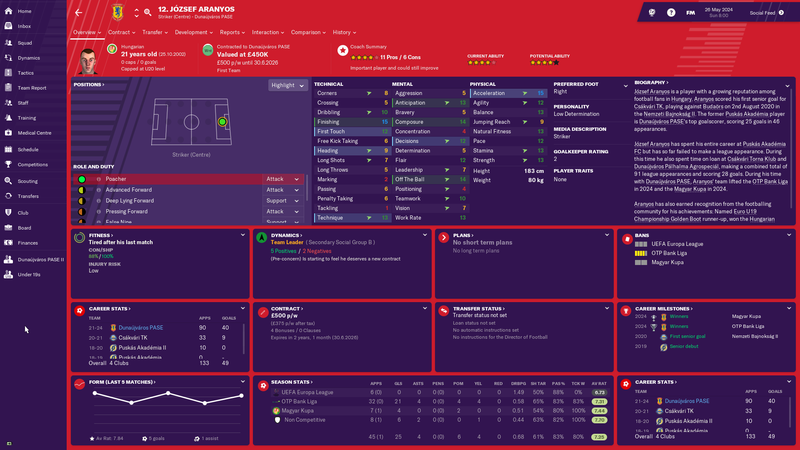 He fit the bill at all counts, so I went big for him and gave him a very high salary, much higher than he wanted, mostly because some top tier teams were putting in bids for him. I were delighted when he chose us. In the winter break I got another talent into my sights. 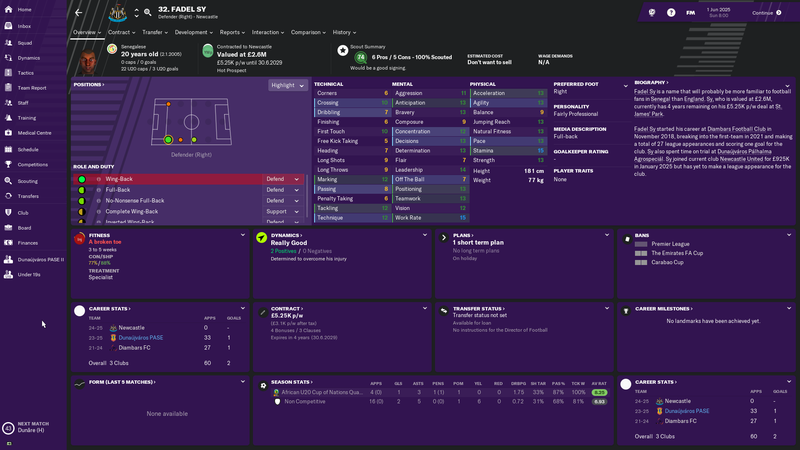 Norbert Kitl are a very talented striker so I bought him as well. Now, in the end Kitl didn't perform as I had hoped, but he is still very young. The season itself started quite poorly as we lost 0-2 in both our first matches. After that we found our footing and went on the nice run I posted above. I went for a slightly deep 4-5-1 with attacking wingers who were mainly depended on counterattacking and it worked wonders for the most part of the season and we were top of the table in the winter break. We kept on winning a bit after, but then teams started to hang back a bit more, so I changed up the tactic to a more attacking one and it worked quite well. In the end we won the league quite comfortably, though we finished rather poorly. The weird thing is that we rarely play well, but we still manage to win. Our top scorer scored only scored 10 goals in 33 matches and our highest average rating for a first team member is 7.00. Quite a strange season, but as long as the results come, I won't complain. 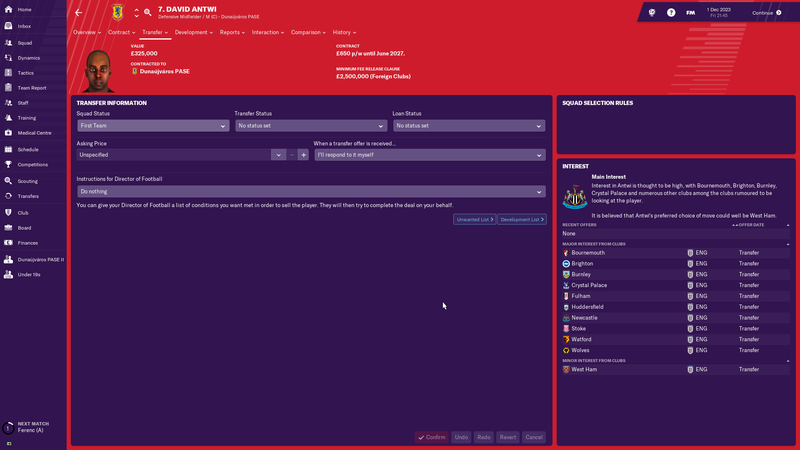 I do worry we might have gotten promoted too soon though, but I don't think the board will fire me, even if I were to be relegated next season. I excited what the future will bring! 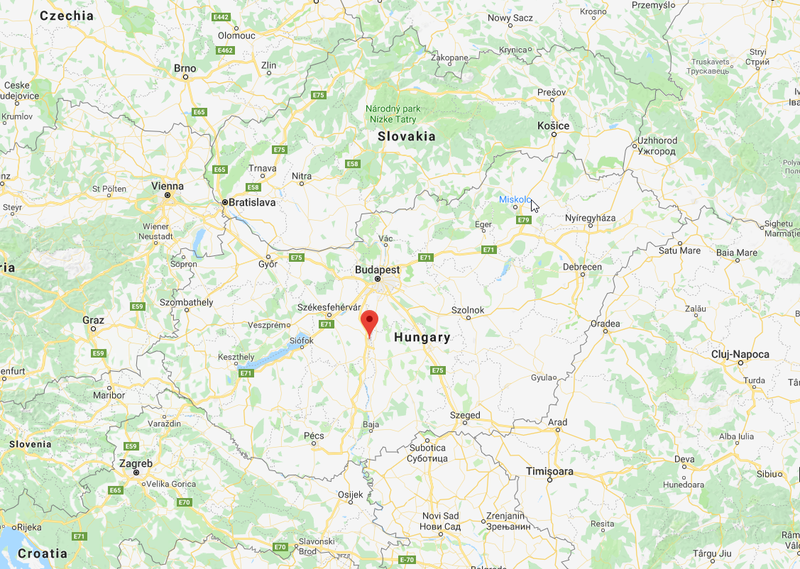 In the Magyar Kupa we embarrassingly lost 2-1 away to lower league side Baktalórántháza (that's quite a mouthful to pronounce) in the 1st round. Congratulations on the title win! In some ways there is never the right time to be promoted and i understand your feelings with my current Bari save, but you have made it. I have similar issues scoring goals too. Thanks! Yeah, I'll just enjoy the ride up here no matter how it turns out. 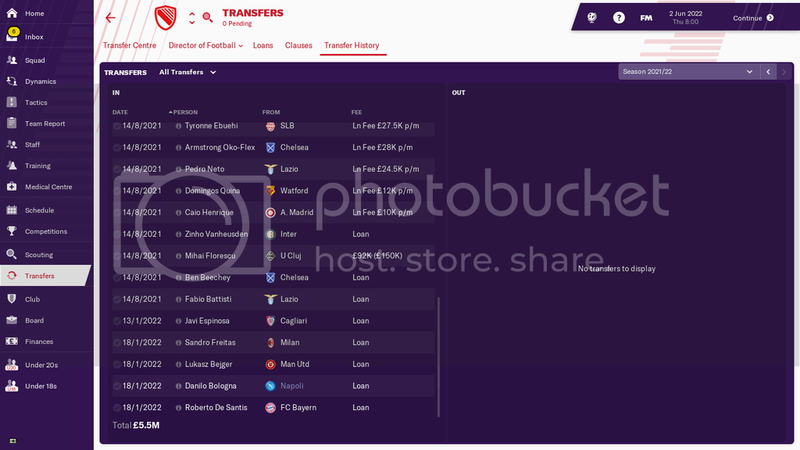 My major issue so far is that I can't find many better players that are willing to come to me, and I don't have much transfer budget to use, so I have to rely on frees. The first match of the season were a home draw to Debrecen who are predicted to fight for the top spots, so that's encouraging. A club with decent facilities and some pedigree - they won the East German top division once and made the last 16 of the UEFA Cup in the 80s, and were in the Bundesliga at the beginning of the nineties. But by mid season I was pretty fed up with them. I'd won only one of the last five games, which isn't great when your side's wage bill means they can't really afford not to be promoted, and languished in 8th place. Above all, I had the horrible feeling that with the squad I'd rapidly assembled, I was underachieving. By the end of January, I'd lost 8 league games. After January, I went unbeaten. Before January I'd failed to score in six of my games. After January, I scored in every game. Around the same time Wehen dropped their lethal 4-4-2 for something more cautious at the same time and their form went in the other direction. They were eight points ahead of me at the end of January and eight points behind me by the end of the season. This gave me a route into the top three, but annoyingly, 1860 Munich were on an even bigger unbeaten run. Title favourites Heidenheim were a model of consistency too, even finding a way to level against me from two down in the last ten minutes. Three games from the end, it looked like I was almost certain to end up with a tricky playoff against a side from the division above. 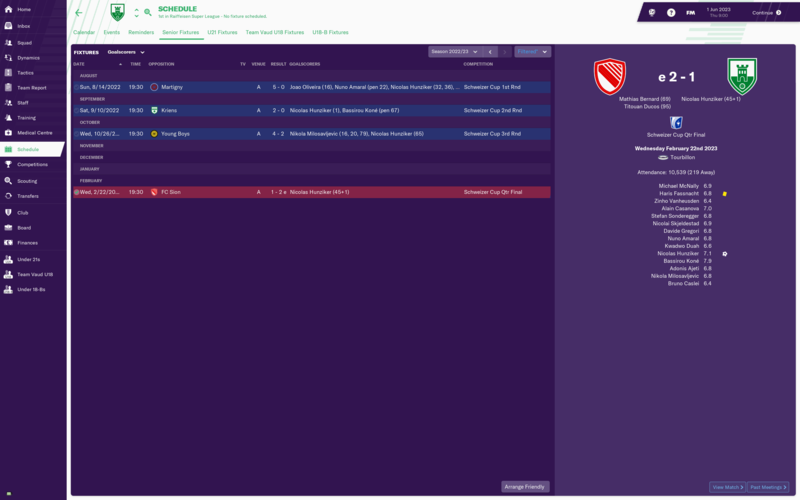 But Heidenheim suddenly dropped points, and a deserved last minute equaliser at Wurzburg meant automatic promotion was still in my hands, just about, on the final day. 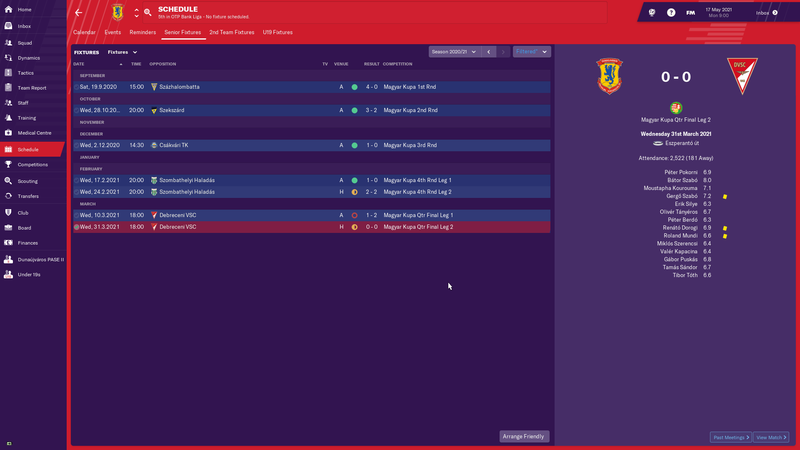 All I had to do was win my final game at home to just-avoided-relegation Lotte by a scoreline two goals better than Heidenheim's. When I took a two goal lead just before half time, this started to look like a possibility, especially with Unterhaching holding on away at Heidenheim. I didn't expect this to last, and threw everything at Lotte (and their woodwork!) in the second half looking for a third and preferably fourth goal, but without success. On 54 minutes, the dreaded goal update came. Heidenheim 1-0 Unterhaching. 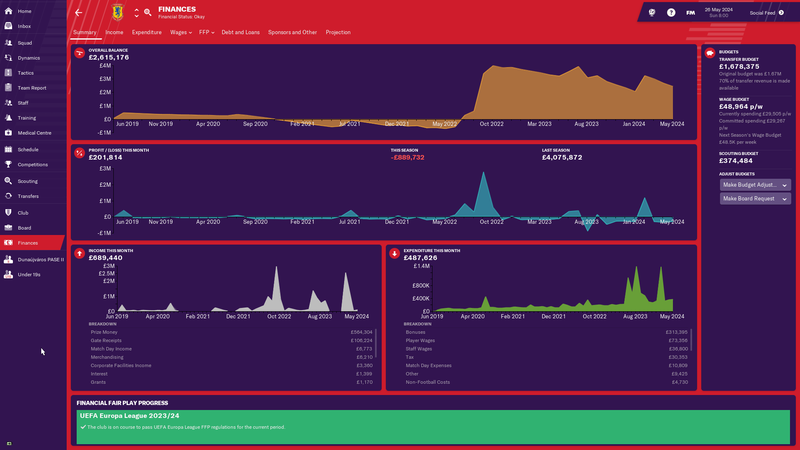 But then came the Heidenheim implosion. On 68 minutes they were reduced to 10 men, which replays showed to be a hilariously unnecessary dangerous slide tackle by fullback Feick. With Feick off (headline writers had fun) Unterhaching promptly equalised, putting me in an automatic promotion spot with 20 minutes of the season left to play. 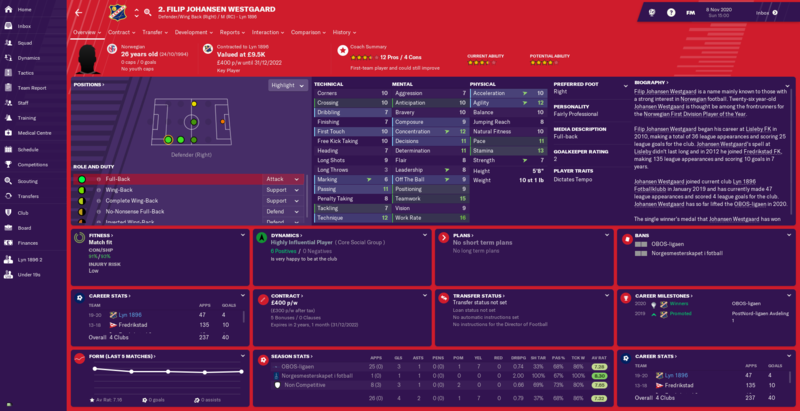 The powerful pair of Wriedt and Manneh soon established themselves as undisputed first choice of the four strikers I loaned, and I signed them on Bosmans for next season as soon as the January window opened. Fuchs was my best permanent signing. On paper the weakest player in the first team, but very well rounded, with the knack of being in the right place at the right time. 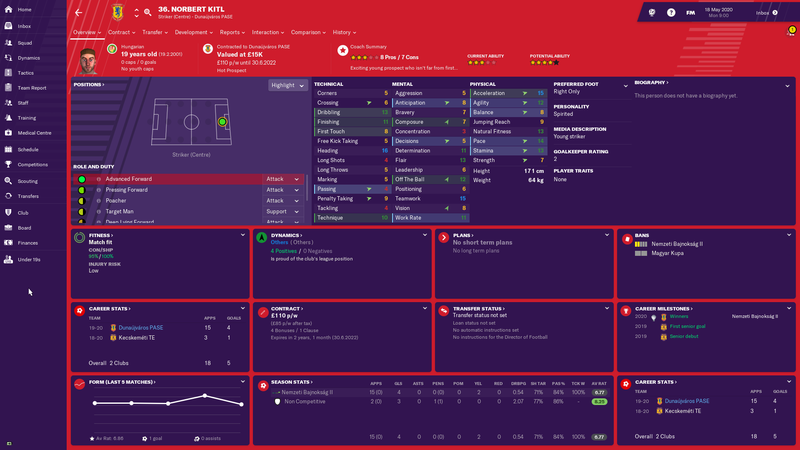 Third top scorer, joint top most creative player, top of all sorts of silly division records like most distance covered and most accurate shots, and as vice captain he was also really good at talking my other players out of complaining. Jansen was worth his wage bill too. 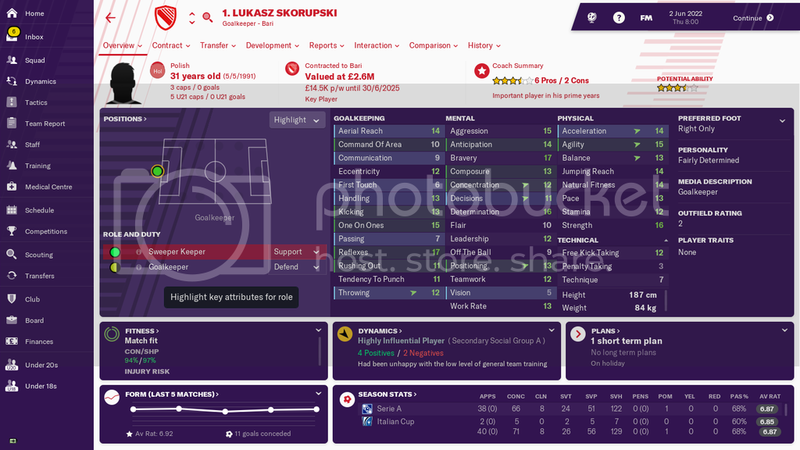 My most dubious signing was goalkeeper Kucz, very good for the level on paper but when I offered him a silly wage escalation contract, I assumed that (i) he had potential and (ii) wouldn't concede two backpasses through sheer sloppiness and kick a cross into his own net..
Well now, here we are, the top of Hungarian football. 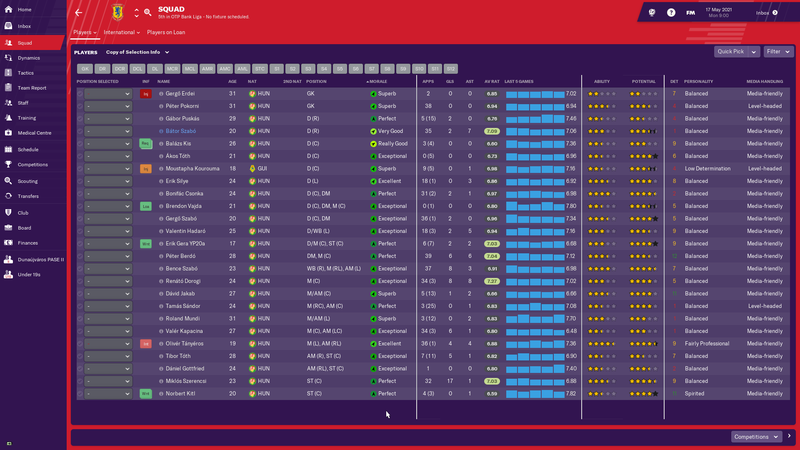 I was unsure how to approach this season, but ended on keeping a lot of the players from last season. This mainly because I really struggle to find clearly better players. The best I can find are usually pretty similar to the ones I already have or slightly better. I did bring in some players and let a few leave, but we are relying on quite a lot of players who were part of last seasons success. When the matches started we just started drawing a lot, and that happened quite a lot throughout the season, and in the end we drew 15 of the 33 league matches. So almost half of my matches ended in a draw. On the positive side this meant we lost very few, but we didn't win a lot either. Towards the end of the season it were clear we were nowhere near the top of the table, but more importantly we were way clear of the relegation zone as well. Going into the final few matches we had an outside chance of a European spot, but didn't make it in the end. Still, a great 5th place is very good. Actually, looking at it again, we might get a spot since the final of the Magyar Kupa is still to be played between Ferencvaros and Videoton, both are already qualified for Europe. So, maybe a spot? We shall see. Ferencvaros ran away with the league early though and didn't lose a game until the 27th round. 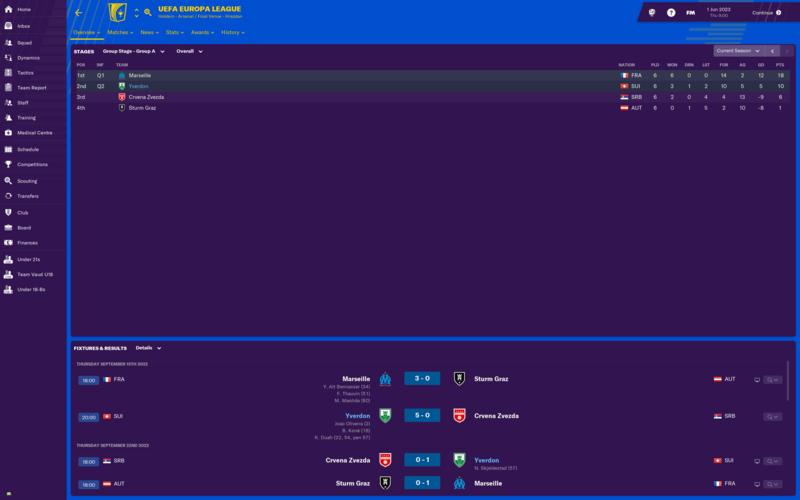 In the Magyar Kupa we beat Százhalombatta, Szekszárd, Csákvári and Szombathelyi Haladás before losing to Debreceni in the quarter final. A good season last time, so it was time to go again. 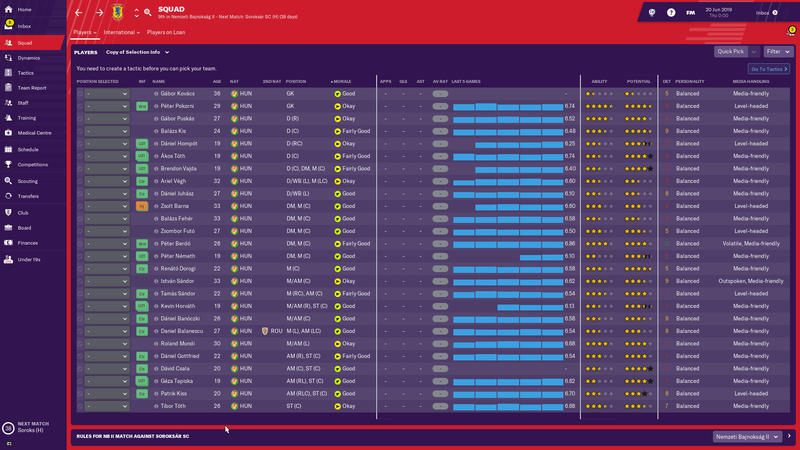 In the summer I sold a couple of players I didn't need, and brought in some better players to improve the quality of the squad quite a bit. However, the season started pretty tough with losses to Ferencvárosi and Videoton. But after the initial losses we started to play better. 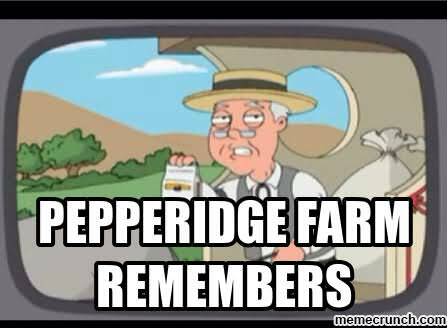 The two aforementioned teams ran away with the league early on, and had a lead of 10-15 for a long long time. 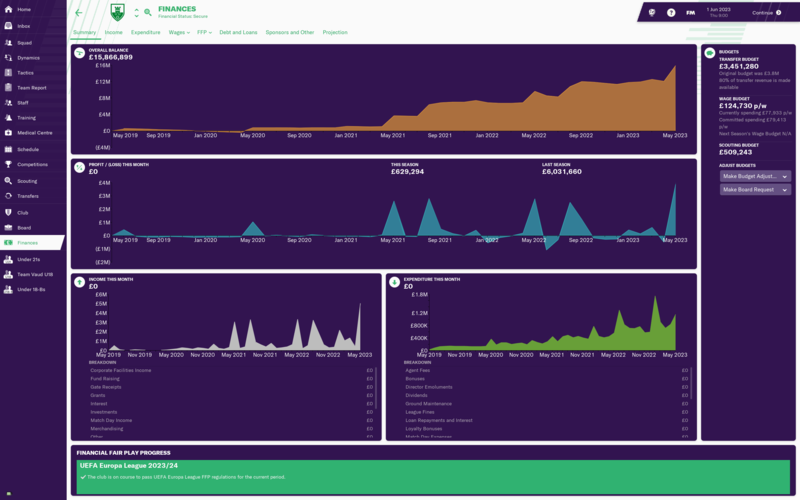 We found ourselves in a follower group along Puskás Akadémia, Paksi and Újpest fighting for the rest of the top spots. 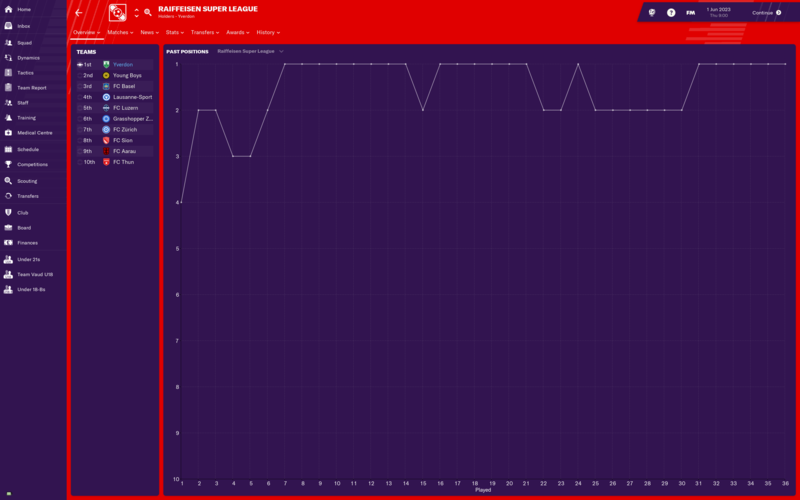 A bit after Christmas Videoton had a rather rough patch. Not that they lost a lot, but they only won 1 in 10 and suddenly we and Puskás Akadémia had caught up with them. 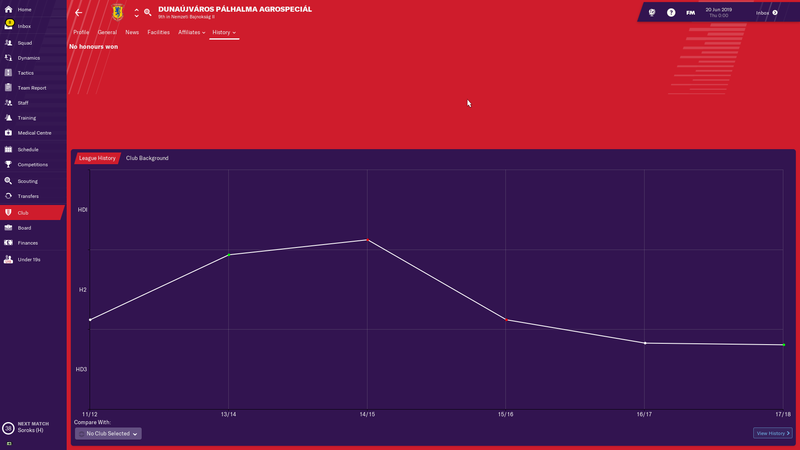 Then Puskás Akadémia had a rough patch and we got a bit of a gap down to the other teams. Of course, Ferencvárosi were far ahead and we never looked like closing the gap on them. Videoton found their form and going into the last match of the season we fought for the 2nd place. Videoton were only a single point behind us. 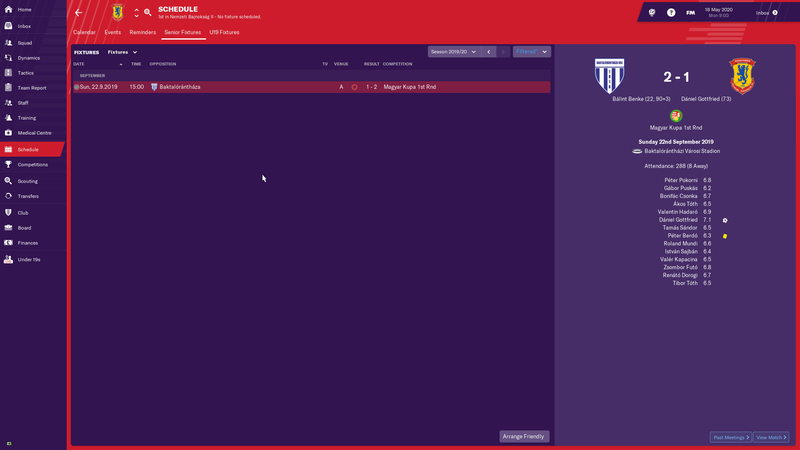 We did mange to scrape a win away to Újpest, but we would likely had won it anyway since Videoton only managed a draw at home to Puskás Akadémia. I'm very happy with the season and we are now qualified for the Europa League next season. I'm extra happy since we have two youth players in the main team. Erik Gera YP20a is a great talent and our first choice for DPL in midfield. Richárd Nagy YP21c plays a lot on the right of the defence and did great this season. This year we also got in a great goalkeeper in Are Sikveland YP22c. My fellow Norwegian is a majorly talented one and should be fighting for the starting spot already next season since he is pretty much the same as my current first choice. In the Magyar Kupa we beat Szentlőrinc, Harkány, Lombard Pápa Termál and Ajka before losing to Videoton in the quarter finals. 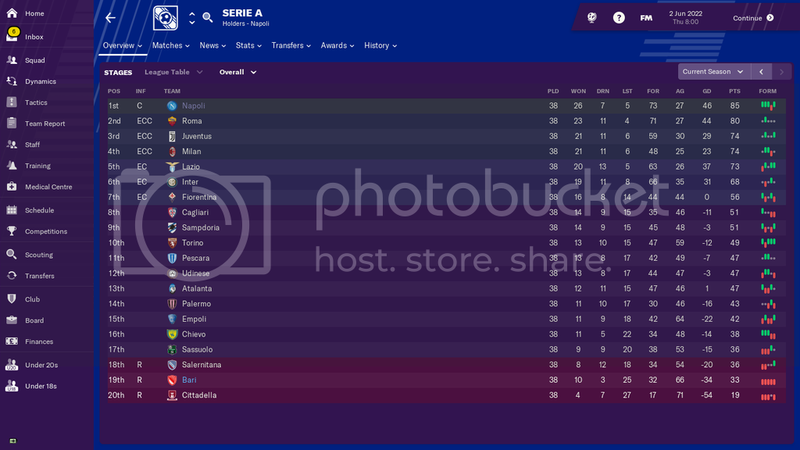 After last seasons shock promotion, I was under no illusions as to how much of a struggle Serie A would be for us. 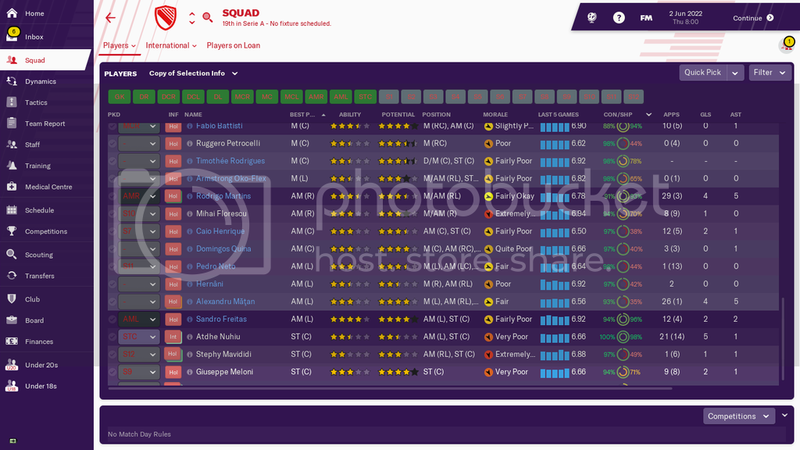 Given our heavy reliance on loanees the squad was quite threadbare and needed major work. I had hoped to rely less on loanees but given our lowly reputation in the top division the permanent deals didn’t happen quite as I had hoped and we once more looked to loanees to add quality to the team. We started slowly with one win in our first ten matches. 3 wins out of 3 in November gave us hope before losing all 5 matches in December. 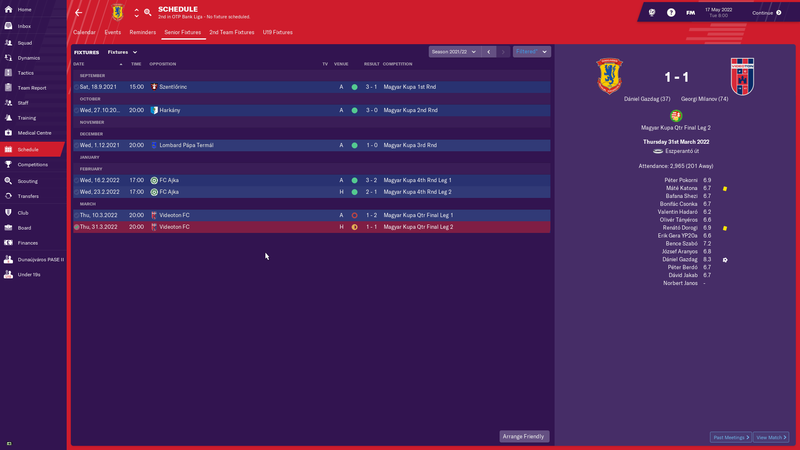 Things didn’t improve much in 2022 save a brief run in March and we ended the season with 5 straight defeats again to end up relegated on the final day. In the cup we lost in the 4th qualifying round against fellow Serie A debutants Salernitana. GK Lukasz Skorupski - Polish goalkeeper who came in and did pretty well under difficult circumstances. So after falling back into Serie B I will be hoping to bounce straight back again. 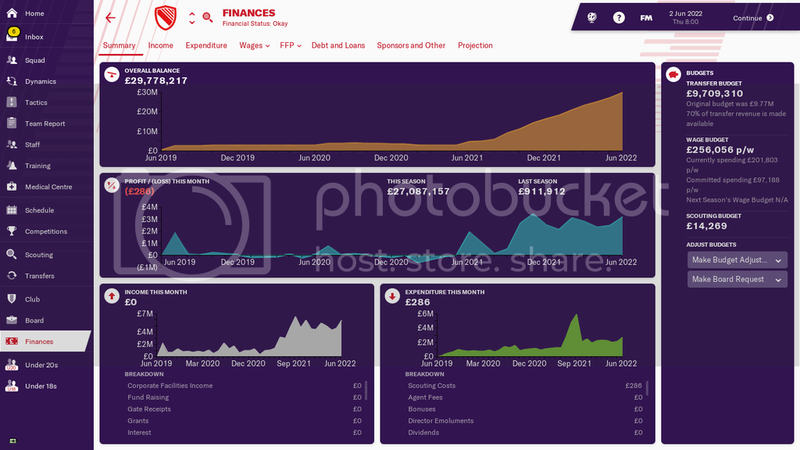 Our finances have had a big boost and will hopefully help us add more permanent players (though I said that last season) We shall see. Having had an aborted Dafuge challenge I'm having my obligatory annual challenge in the Swedish leagues a bit early this year. 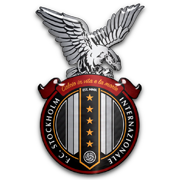 No IFK Trelleborg this year so I've gone for Stockholm Internazionale. 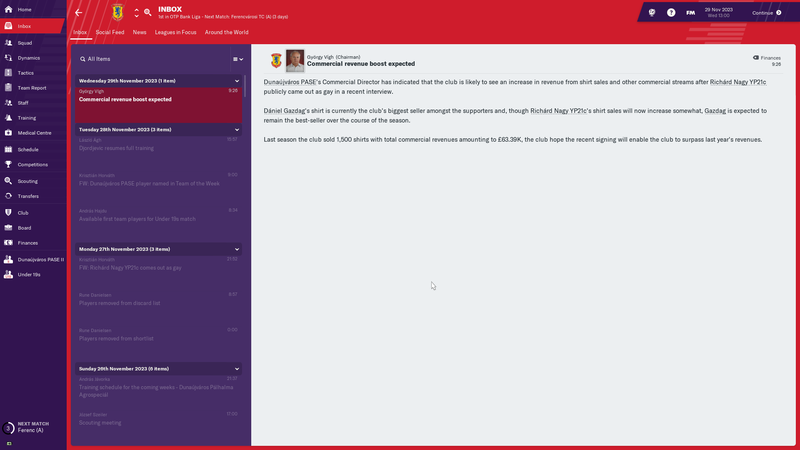 Despite losing three of our first four games promotion was secured at the first time of asking. I hadn’t expected promotion so this was a nice surprise. Previous years in Sweden it has taken me 2-3 seasons to be in a position for promotion. We were very consistent once we got into our stride however and quickly climbed the table. I somehow managed to amass a squad of 50 players, many of them interchangeable because of similar ability levels. By the middle of the season I was finding I was losing track of who was my first eleven and who wasn’t. Players dropped out through injury and got lost in the crowd for months. Looking forward to a clearout in the summer. 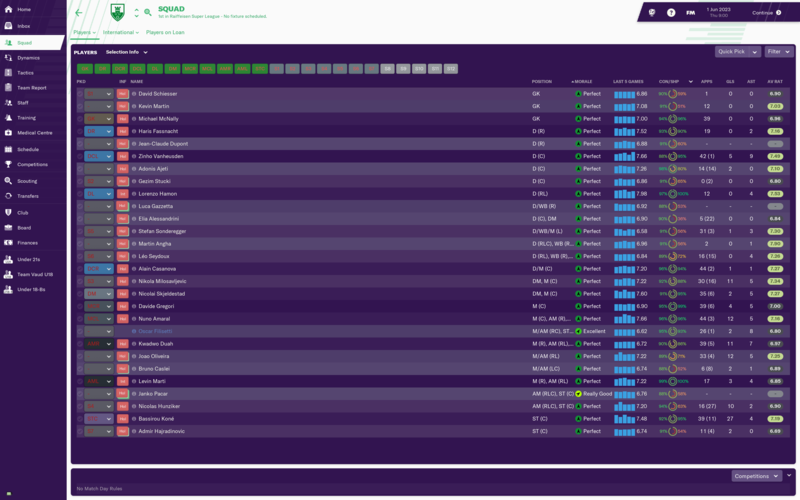 I have 32 players out of contract so will look to move on the deadwood. Ibrahim Bah – Scored 14 goals in 25 games and deservedly was named striker of the year. Didric Andersson – Solid in defence and named defender of the year.. I just had an amazing goal. Please disregard the choppy movement, uploading never works as I would like. Yes, that is an overhead kick from a throw inn! This was a very strange season. Especially because of the winter World Cup having an impact on pretty much all competitions, but it also meant that fixtures were clumped together in a rather strange way. Since I had a good run in Europe (more on that later) it meant we had issues in the early stages of the season were we played 4 matches a week for a while. I didn't see that coming, so I had some major issues with fitness and that impacted on results. So in the league we started quite poorly, and were far behind Videoton and Ferencváros from the get go. Puskás Akadémia and Paksi also had good starts with Diósgyőri not far behind. 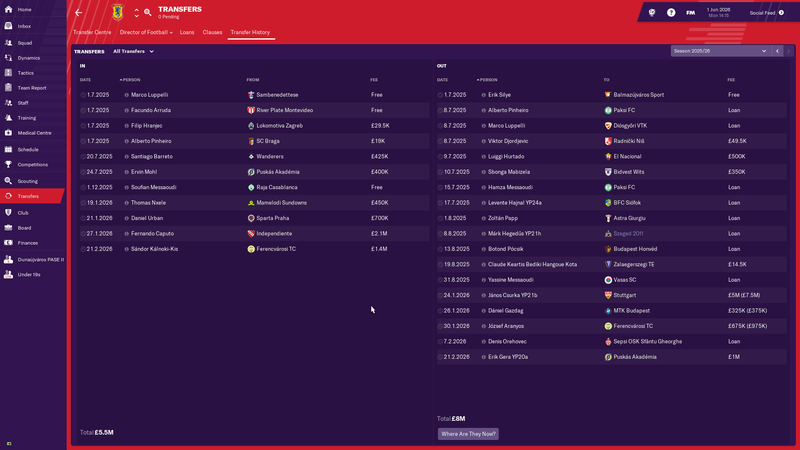 I did notice that African players don't count as foreign in Hungary this season, and this means I can bring in loads of them without having issues with squad registrations. Of course, this meant I sent loads of scouts south to find hidden gems. And I did find one amazing midfielder in David Antwi. Only 18 years old and already one of the best players in Hungary. 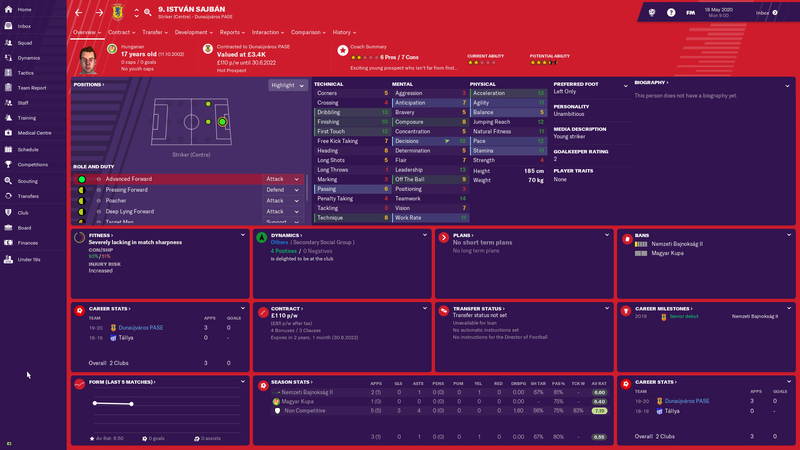 I signed him up for as long as I could, and I hope I can keep him for a long time. He does have a tendency to get early red cards though, but 7 goals in 15 games from central midfield is enough to gamble on him. 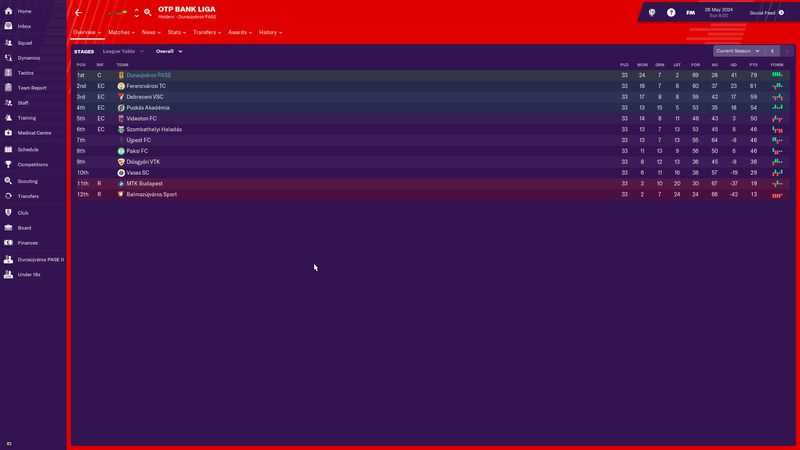 As the season continued we started picking up the wins and climbed up the league and with 5 games left we had an outside shot at the league title, but a decent chance for another spot in the European cups. In the end we ended on 3rd place well behind Videoton and Ferencváros. So we are going into the Europa League next season as well. In the Magyar Kupa we beat Dabas, Kazincbarcika, Jászberény, Iváncsa and Diósgyőri before losing to Ferencváros in the semi finals. I'm really starting to have them as a bogey team. We had our first go in Europe this season since we qualified for the Europa League last season. We started in the 1st qualifying round were we drew Torpedo Kt of Georgia and beat them in both matches. In the 2nd qualifying round we got a tough draw in Bulgarians Ludogorets. We lost 1-0 away, but fought back and won 2-0 at home to go through. In the 3rd qualifying round we got FK Vojvodina of Serbia. One of the easier teams we could have drawn and we beat them without much issues. In the 4th qualifying round we had a tough draw when we got Swiss team Basel. A strong 1-0 win was followed up by a hard fought 1-1 away to go to the group stage! We didn't get the easiest of draws when we got PAOK of Greece, Spartak Moscow of Russia and Celtic of Scotland. We did manage to win away to PAOK, and draw at home to them, in addition to a draw home to Celtic. This finished us at 3rd place, and a credible effort for our first try in Europe. We did get a lot of money for this great run and we are improving some facilities. I did something I haven't done before in these one-club challenges. I attended an interview for another position. Why? Because the board have refused to improve facilities for a while. 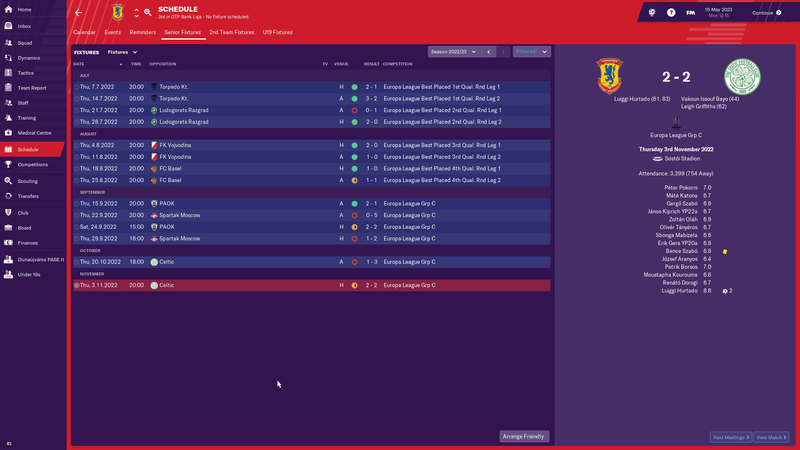 I actually got offered the Videoton job, but the board offered me talks to stay and I told them I'd stay if they agreed on improving the facilities. They accepted and I stayed. Now, I would have stayed at any rate, but I haven't used my position as a bargaining chip before. It's nice to know that this works, and that we can use them to our advantage. A small tip for those of you that have to endure negative boards. I did notice that African players don't count as foreign in Hungary this season, and this means I can bring in loads of them without having issues with squad registrations. Well colour me embarrassed. African players are not counted into the "non EU" foreign cap, but they DO count to the "foreign" part. 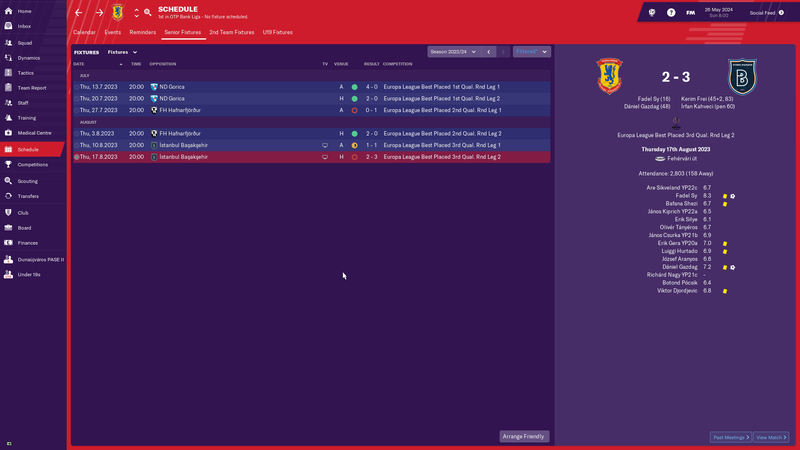 Unlike last seasons unexpected promotion, this season following an excellent recruitment campaign I fully expected promotion. It was harder than I imagined however as we needed the playoffs to secure this. 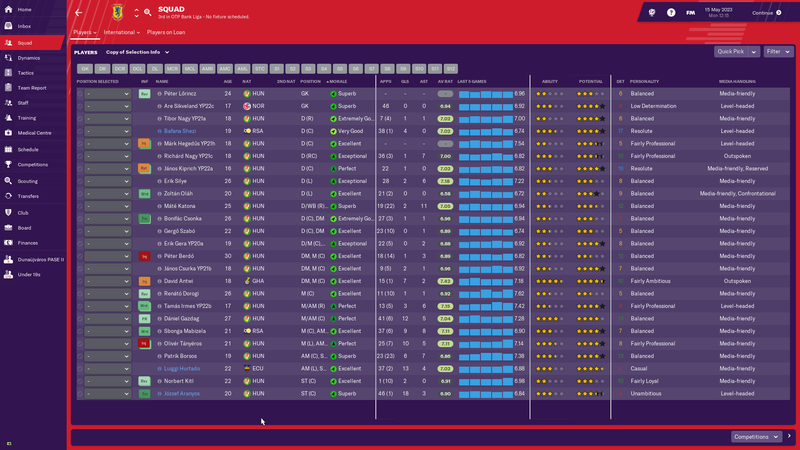 In the summer I essentially replaced the entire first team that achieved promotion last year with a new line up. Key to this were the three players who would be deployed in the attacking midfield strata of my 4-2-3-1 formation. Two Swedish born Palestinian internationals and a Ugandan lined up here and were the stars of my team. Between them they scored 35 goals and contributed 19 assists. 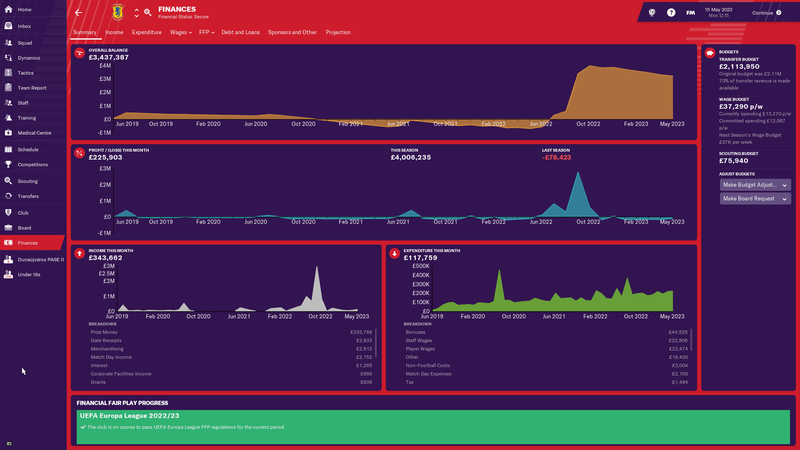 Financially we are struggling with £175k of debt. We are one step from the top flight however, I am not anticipating this step up next season but the way things are going you never know. Mahmoud Eid – One of two Palestinians in my side the ex-Kalmar inside forward scored 12 goals from wide..
Moustafa Zeidan – The other Palestinian is 22 year old playmaker Zeidan. Had a good season. Lumala Abdu – Ugandan wide player was the star of the season scoring 17 goals in 28 games. 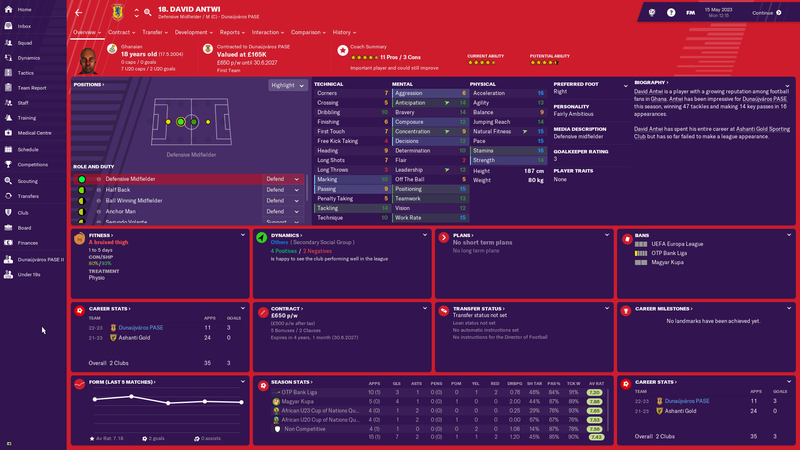 I think I might lose Antwi soon.... some might trigger his release clause. Good money to find the next David Antwi, I guess. Reckon Everton might let him back on a cheap or free loan? Thinking about taking the challenge up in Turkey. It's a country I've never managed and I've seen some cracking regens from there. So finally a normal season, no Qatar-based World Cups to screw up the schedules or anything. 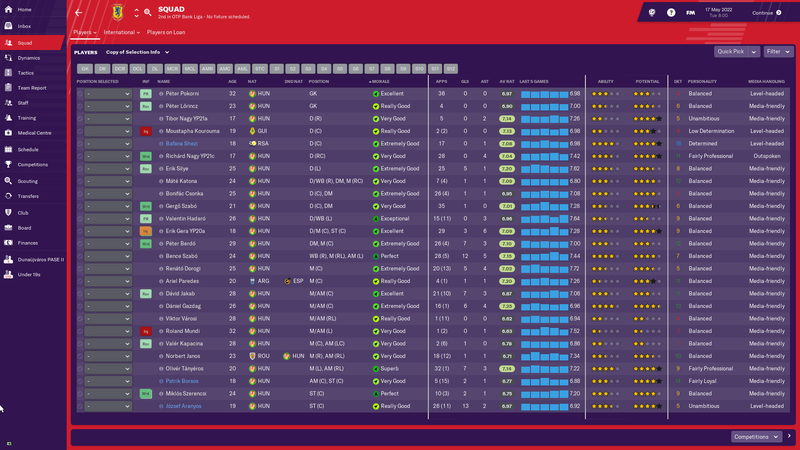 During the summer my transfer plans were quite simple; try to sign the best players I had on loan last season. And I did. Aranyos, Shezi and Hurtado were all signed on permanent deals. I also managed to get rid of some deadweight from the previous seasons, and even got in a bit of cash for a couple. When the season started we started with a bang, 10 wins from the first 10 matches gave us a headstart on all opponents. Ferencváros had a shocker of a start and were close to relegation before they fired their manager and started to climb. We kept the lead into the winter break and were comfortable top. 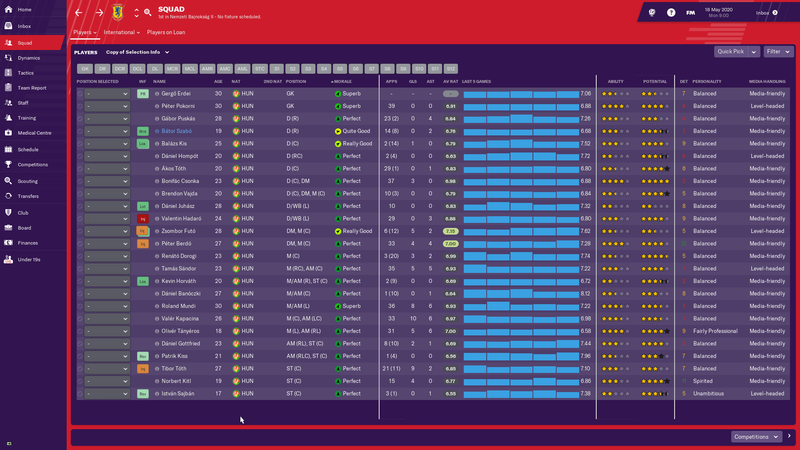 We did lose David Antwi to Everton as they met his clause of £2.5M, and I haven't really replaced him, but at least we had good backups. During the rest of the season we controlled the league and clinched the title with games to spare. So we are going into the Champions League next season! In the Magyar Kupa we beat Ceglédi VSE, Budafok, Kisújszállás, Nyíregyháza Spartacus, Győri ETO and Debreceni to reach the final. Of course, our opponent were Ferencváros. The final started great when striker József Aranyos ran past 3 defenders and slotted the ball into the bottom corner of the net. They pegged one back 10 minutes later, but then they gifted us a goal when they put it into their own net after a corner just a minute after. Winger Olivér Tányéros added our third not long after, but Ferencváros reduced the lead before the half time break. Not long after the restart we got a pen, but Sbonga Mabizela's attempt got saved. Then we gave away a pen and allowed them to equalise the score. The winner came in overtime when Tányéros added his second to win us the cup. So we got the domestic double this season! 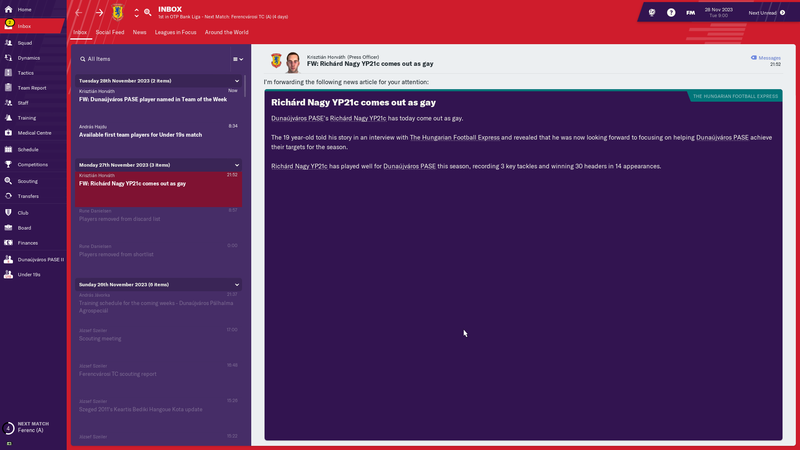 In other news we had a youth player come out as gay, and this gave us increased revenue! Other than that I'm still working on facilities and other improvements to the club. We also had another go in Europe this season. As last year, we started in the 1st qualifying round in the Europa League. We drew ND Gorica of Slovenia and dispatched them without ease. In the 2nd qualifying round we lost away to Icelandic FH Hafnarfjörður, but won at home to push on through. In the 3rd qualifying round we had a tough draw in Turkish side İstanbul Başakşehir. A very credible 1-1 draw was unfortunately followed by a 2-3 loss at home to eliminate us. Time to try again. Always wanted to do something in France and Athletico Marseille seems like a fun one. Strong desire to be Marseille's second team, just rebranded in 2018 from Marseille Consulat. Several players from the Comoros National Team (I honestly had never heard of Comoros before looking at this team). And a pair of brothers starting. 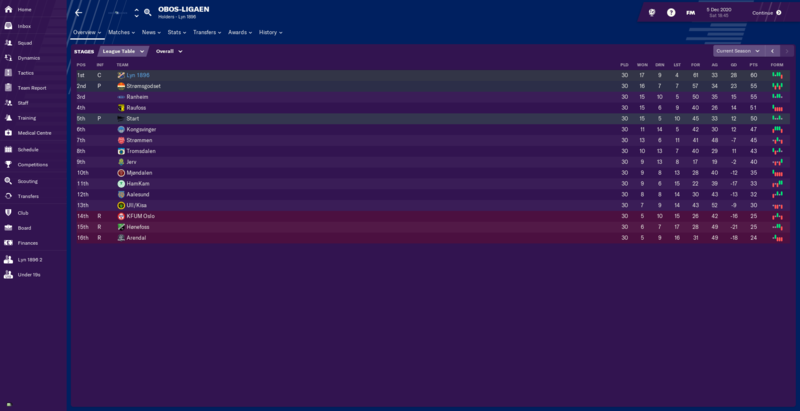 They were in the National League a couple seasons ago, missing promotion to Ligue 2 by a point one season and on goal difference another before getting relegated in 2017-2018. All the clubs that come up in Turkey have a transfer policy of "cannot sign non-turkish players". In fact all the clubs in the turkish 3rd division have the policy. Does anyone know if this will change as we go up the leagues? That's good news, but I think I've moved on from this before I even started. I don't know how many of you guys remember me, but I've had many cracks at Gundo's challenge before they merged. I tried lots of different countries but I always come back to Fjarøabyggø in Iceland. I haven't gone there this year because on FM19 Iceland is bugged. 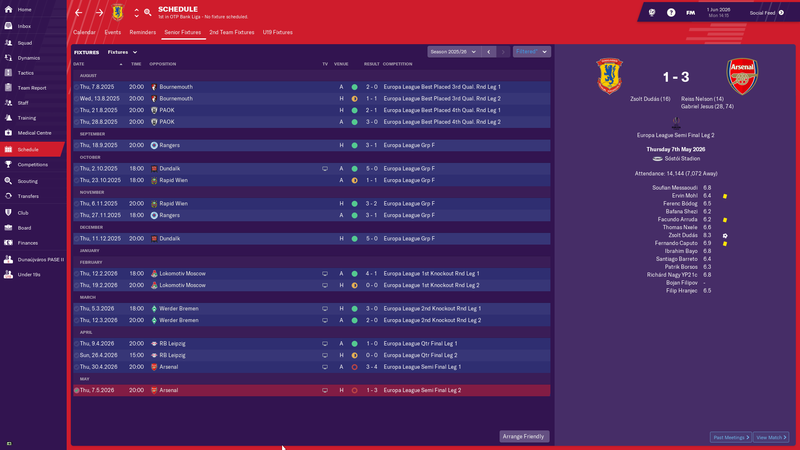 The u19 sides aren't working properly and bringing through youth is a huge part of how I play. The u19 sides in Iceland are affiliated clubs in this version so players need to be loaned to the u19 side. This more accurately reflects how it works in Iceland in real life, but it doesn't work as intended because players often reject the loan or the board terminates the link leaving you with no way to develop your youth. So, I don't know if edited databases are allowed or not (I assume they aren't) but I'm doing it anyway. 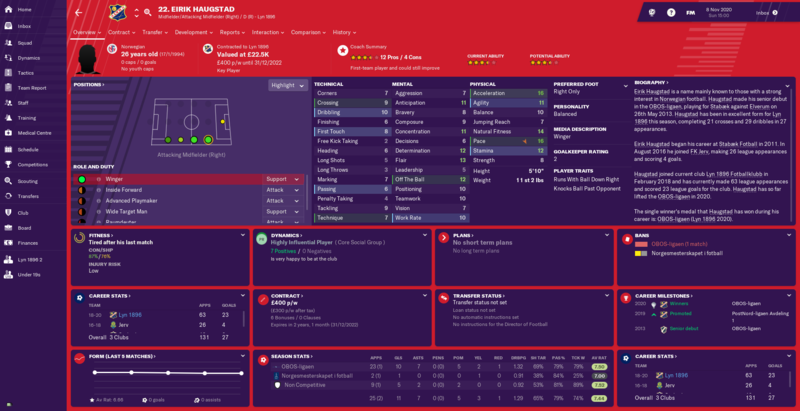 Classen's megapack fixes the u19 structure in Iceland, putting it back to the way it was in FM18 and previous, with each club having a standard u19 team. 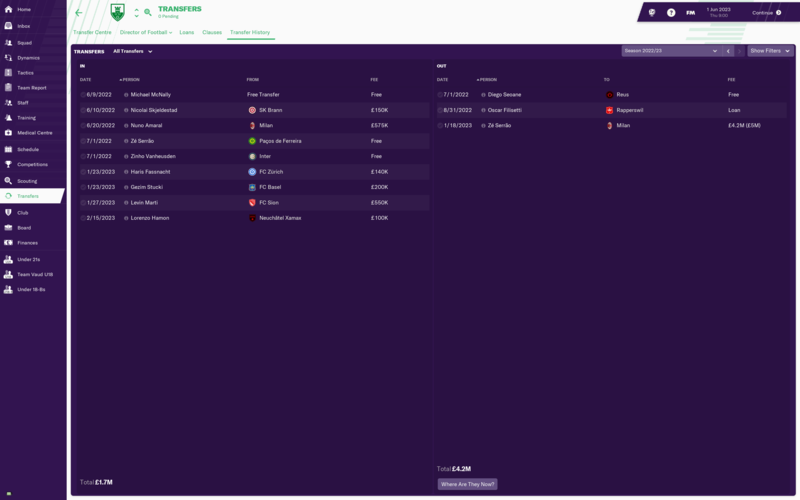 The megapack includes Iceland down to the 5th tier, but rather than selecting Fjarøabyggø directly I'm still going to only load the top 2 leagues and holiday until I get them. I don't know if the updates league in Iceland is ok for this challenge or not, but I need to take a look at it for a youth only save. Tried it, but the youth structure made it pretty much impossible. 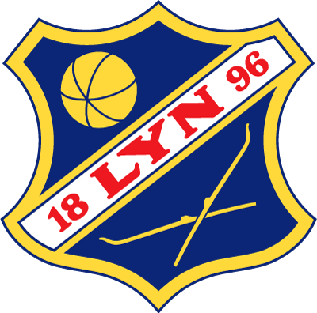 After 2 promotions in my first two seasons, I got relegated from the Swedish second tier in my third season. Then I got sacked.. bit harsh I would say but hey-ho. Pretty much what happened to me in my previous Dafuge save. I'll be back for another crack in a month or two but going to have another go at a Dafuge. The double last season gave us good hope for the new season. We got rid of some of the poorer players and got in a couple of good ones and didn't lose anyone I wanted to keep. The season started very good and we were doing great, albeit having Ferencváros and Videoton at our heels were an issue and we didn't manage to shake them. Then, during the winter break we started to get bids from a lot clubs for our players. First we lost our first choice right back, Fadel Sy, to Newcastle after the board accepted a small-ish bid. 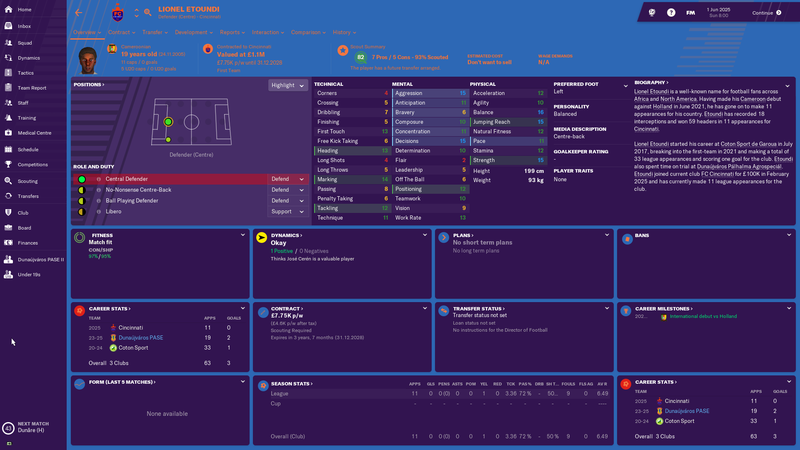 Then we lost one of our best central defenders, Lionel Etouendi, to USA due to me not noticing he had a ridiculously low release clause at just over £100k. When I had big issues finding suitable replacements, we went into the second part of the season severely weakened. And it showed, we lost matches we should have won, and our issue were clearly in the defence. Although, it didn't help that our best striker had a long goal drought. The latter were we able to handle due to our amazing local midfielder János Csurka YP21b who scored 11 goals in 20 league appearance from central midfield. With 3 games to go we only had an outside chance for the title and we needed Ferencváros to lose at least two matches. When we lost at home to Videoton the issue was more or less settled. I really need to go on the look for better defenders this summer as that is our main problem area. 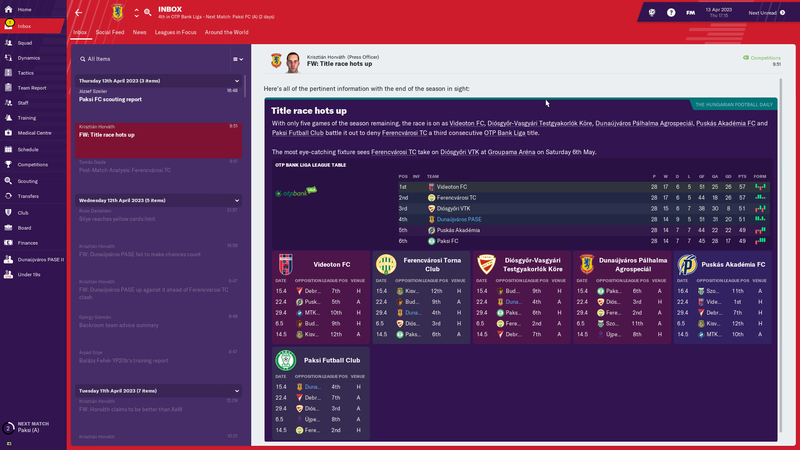 In the Magyar Kupa we beat Tata, Balatonlelle, Kazincbarcika, Csákvári, Ferencváros and Videoton to reach the final. Here we comfortably beat Paksi 3-0 to retain the trophy. We had another go in Europe this season and this time in the Champions League. Our first opponent, in the 2nd qualifying round were Cypriots APOEL. We lost 1-2 away, and only managed 1-1 at home to be knocked out. This, of course, means we go into the Europa League and we entered in the 3rd qualifying round. Here we got Northern Irish side Linfield. They turned out to be a fair few levels below us as we beat them 5-0 and 7-0 to go through. In the 4th qualifying round we drew Levski Sofia of Bulgaria. An amazing 5-1 win away were followed by the same win at home to go into the group stage. In the group our opponents were Braga of Portugal, Viktoria Plzeň of the Czech Republic and Rapid Wien of Austria. We beat Viktoria Plzeň in both games and also beat Braga at home. This ended us in 2nd place, behind Rapid Wien and qualified us for the 1st knockout round. Here we had a very tough draw when English giants Arsenal were our opponents. We lost both matches 0-2 and got knocked out. A very good effort in Europe this season and the financial package is really helping us. 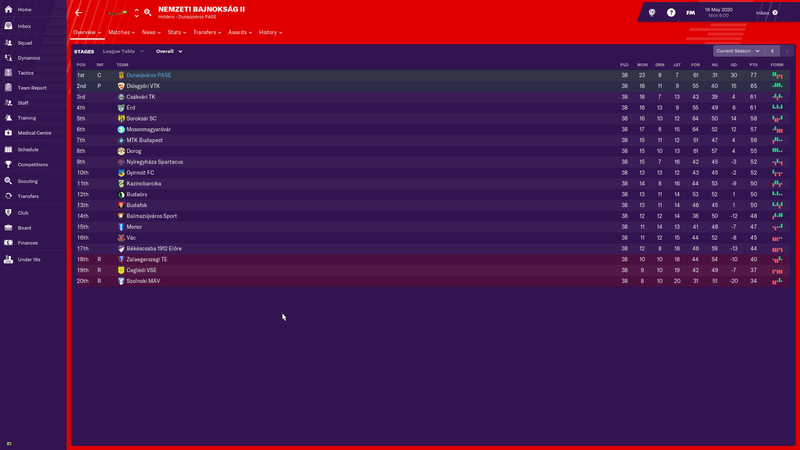 Promotion instead came at the end of April, when I wasn't even paying much attention, with a last minute equaliser for Union Berlin meant that Hertha BSC were no longer capable of catching me. I'd only gone out the cup two days day before that despite repeatedly being drawn against Bundesliga opponents, which gives you an idea of how well my season was going. I'd expected my strikers were good enough to ensure I comfortably survived in the Bundesliga 2, but I hadn't expected to dominate it. 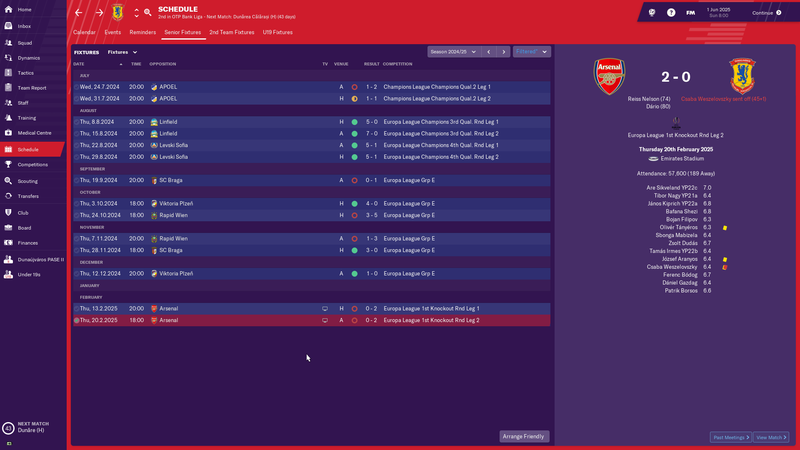 My side actually looked out of their depth in the opening game and needed some pretty desperate attacking at the end to scrape a draw, which persuaded me to loan in Germany U21 internationals Bisseck and Mbom to strengthen further. 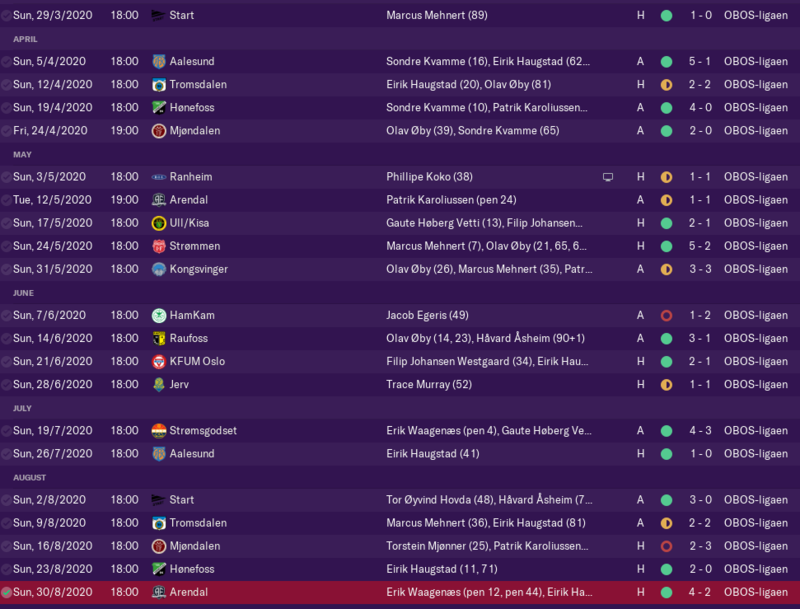 Back to back defeats to injury time goals (I concede too many like that...) in September ended a 22 game unbeaten streak dating back to last season, but by that stage I was already starting to look like an unlikely promotion contender. At the winter break, I was eight points ahead of the rest of the pack, and there was no way back, even though both my title rivals (an underachieving Hertha BSC and massively overachieving Jahn Regensburg) beat me. Back to back promotions? Yeah, I've done that before, said my club captain and ex-RB Leipzig man Hoheneder. "But for some reason everyone hated us, instead of loving us". 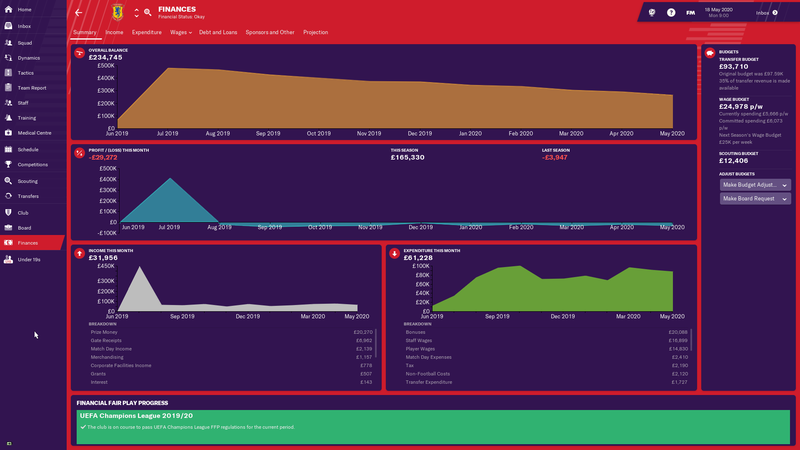 This season was different, and partly it was down to doing it with a wage budget about the same as the weekly wages of one of Hertha's strikers. But also, there was the cup run. 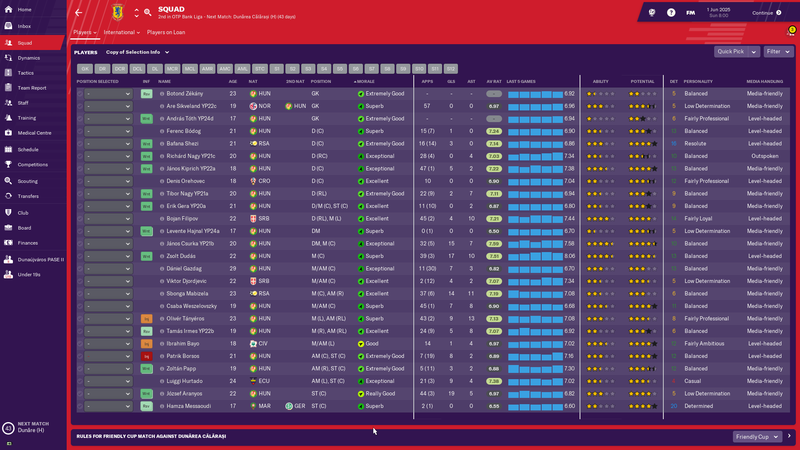 I added the pace of Osawe on a freebie to go with the permanent captures of last season's strike force Wriedt and Manneh and was much happier with the two keepers I signed for less than half the wages of the last one - both of them got the chance to be shootout heroes too. Wriedt matching last season's feat of 21 goals and a promotion has made him a club icon, and so he's earned his shot at the Bundesliga. 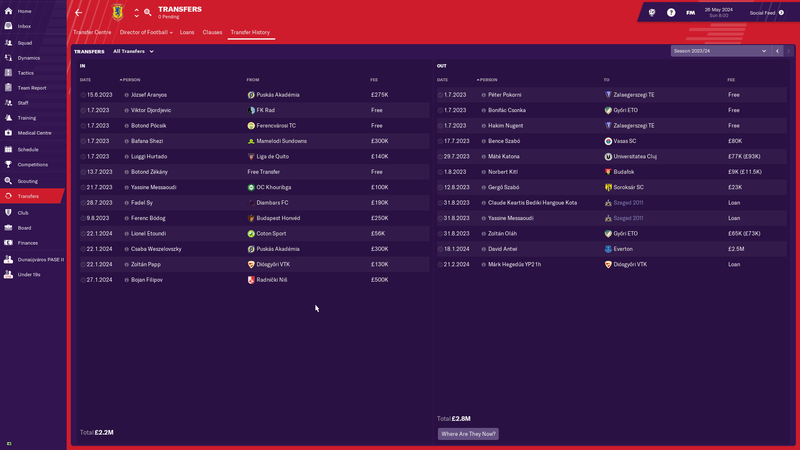 The core of the side is now very loan-heavy, but some of them feel like my players, and next season I ought to get some money to actually pay transfer fees. Egbo will be joining me on a Bosman at the end of the season, having been part of all the sides promotions' (he was originally loaned in by my predecessor). Disappointing, considering I paid for upgrades when the cup run money came in. Frik stands a decent chance of first team action in future, but he'll probably be the only one. 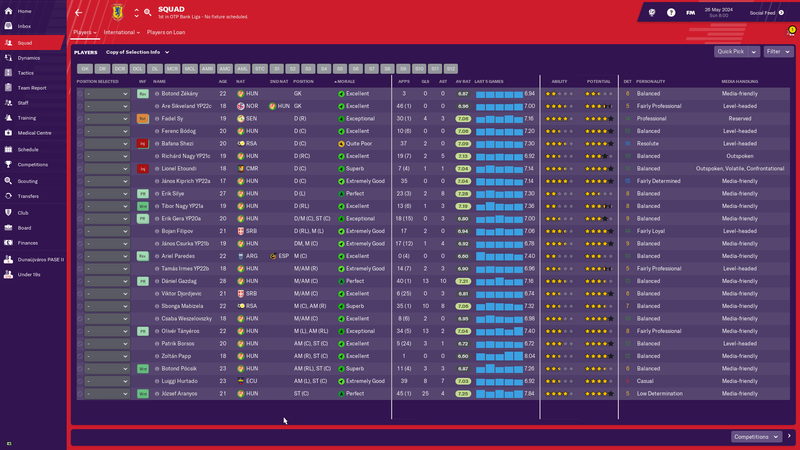 The rest of the youth side is flourishing nicely though, with half my squad rated as having Bundesliga potential. Some of them might even get to play there. The 5-2 match was a cup match played mostly with the reserves, so I don't really count that. Other than that I've only conceded 1 goal the last few months. We are not quite firing on all cylinders offensively though, so some small tweaks are still in order. Losing the title to Ferencváros last season was a bit of a kick in the teeth, but I identified the defence as the prime suspect and were eager to fix it this summer. I got in some good defenders and a goalkeeper though he came a bit into the season. 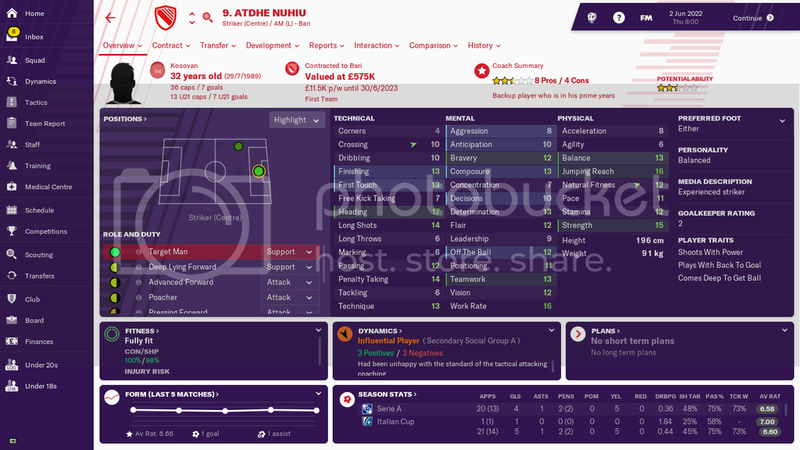 The most eagle eyed of you might have spotted something odd about my players. And, yes, I do in fact have 3 players with the same last name and all Moroccan. 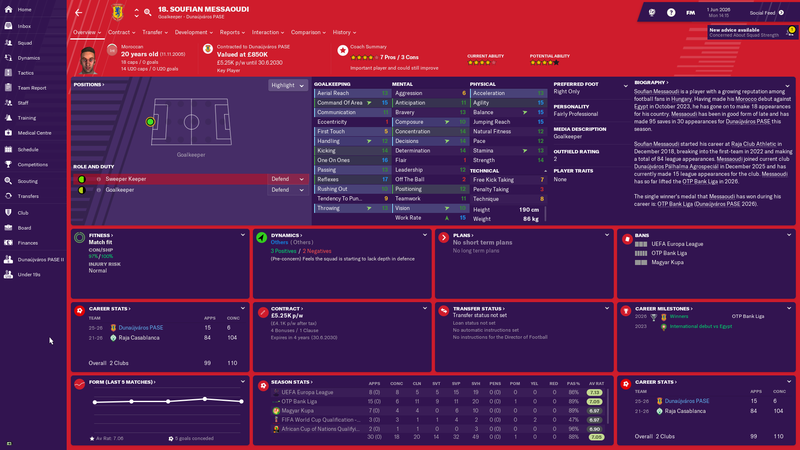 Soufian Messaoudi is our new first choice goalkeeper that I brought in for free from Raja Casablanca. Only 20 years old, but the first choice for the national team and a very talented stopper. 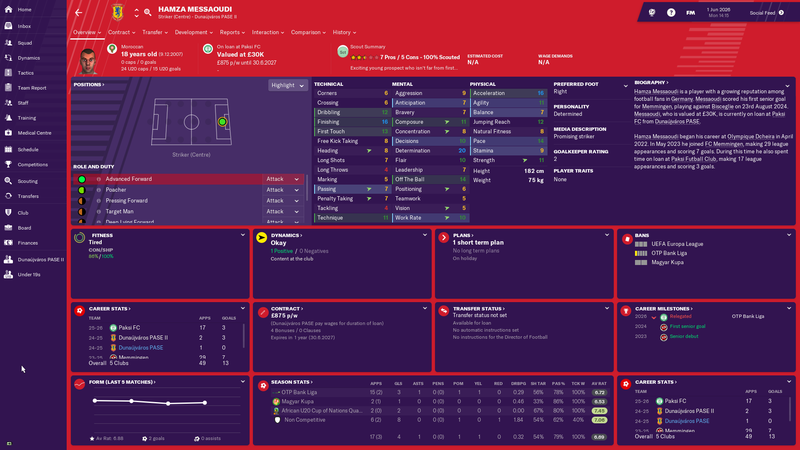 Hamza Messaoudi is a striker I brought in a couple of years ago from a German club for pocket change. He still have some way to go, but spent the season out on loan. The third one is Yassine Messaoudi who also is a striker out on loan. Now, I don't know if Messaoudi is the Moroccan version of Johnson, or that I just happen to find them by chance, but they are not related, at least it doesn't state so anywhere. Back to the football. We had a good start to the season, but not fantastic. We were on top of the table, but had a couple of team chasing us. Ferencváros and Debrecen being the leaders of the pack. Going into the winter break we had a slight lead, but had all the possible choice of getting caught. It was around then we had the great run I showed earlier. We almost stopped conceding and managed to sneak in wins. When the other teams then had some poor forms we suddenly were quite far away from the rest and could rotate a bit for the league matches. In the end we won it quite comfortably. The most impressive fact was that we only conceded 13 goals in 33 league games. Hopefully, we can continue this into next season. In the Magyar Kupa we beat Diósd, Kecskeméti, Békéscsaba, Hódmezővásárhely, Ferencváros and Vasas to reach another final. Here we got Szombathelyi Haladás as the final hurdle. Unfortunately, we lost the final 0-1 after they snatched an early goal while we didn't manage to break them down. When we even missed a penalty towards the end it summed up our luck. No Champions League this season, but we still had a try in the Europa League. We started in the 3rd qualifying round and had a tough draw when we got Bournemouth. An amazing 2-0 on the south coast of England were followed up with a 1-1 draw at home. In the 4th qualifying round we got Greeks PAOK as our opponent. With a 2-1 at home, we countered them out in Salonika and won 3-0 there. In the group stage we drew Scots Celtic, Dundalk of Ireland and our old friends Rapid Wien of Austria. We won all matches except a draw away to Rapid Wien and topped the group to go through. In the 1st knockout round we faced Russians Lokomotiv Moscow. A fantastic 4-1 win away were followed by a tempered 0-0 at home to go through. In the 2nd knockout round we met German outfit Werder Bremen in a tough draw. Somehow we smashed them 3-0 and 2-0. In the quarter final we drew Red Bull, um, Rasenballsport... Leipzig. A very undeserved 1-0 win in Germany and a heroic defensive effort for the 0-0 draw at home put us through to face the team that knocked us out last year, Arsenal, in the semis. At the Emirates we gave it our best and narrowly lost 4-3. In the return fixture we just couldn't compete with players like Gabriel Jesus and Jadon Sancho and we lost 1-3 to get knocked out. Still a great and very surprising run in Europe.